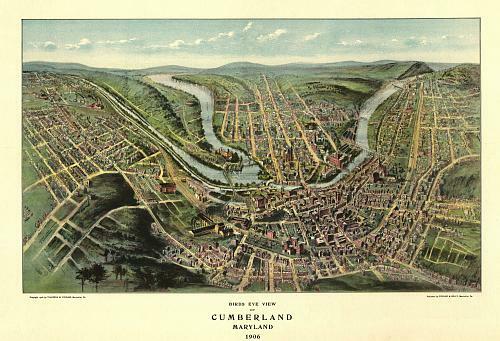 Dr. William Wyett Wiley’s map of Cumberland, Maryland, a town struck by enteric or typhoid fever in the winter of 1889/90. Cumberland is not much different from tens of thousands of other towns in the U.S. back in 1890. 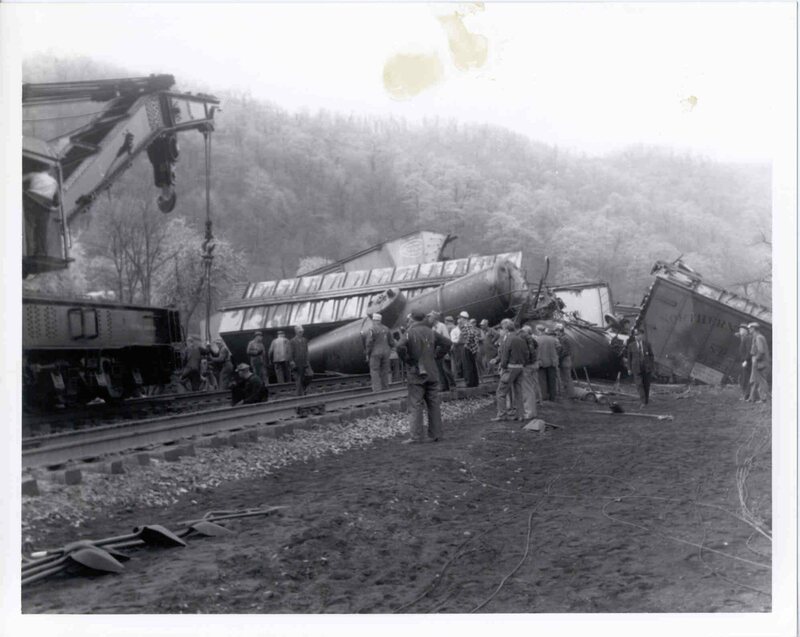 With a population of about 12,000, it served as a connector between the eastern United States and states located west of Appalachia. One hundred fifty years earlier, the US Government raised a fort in this setting. 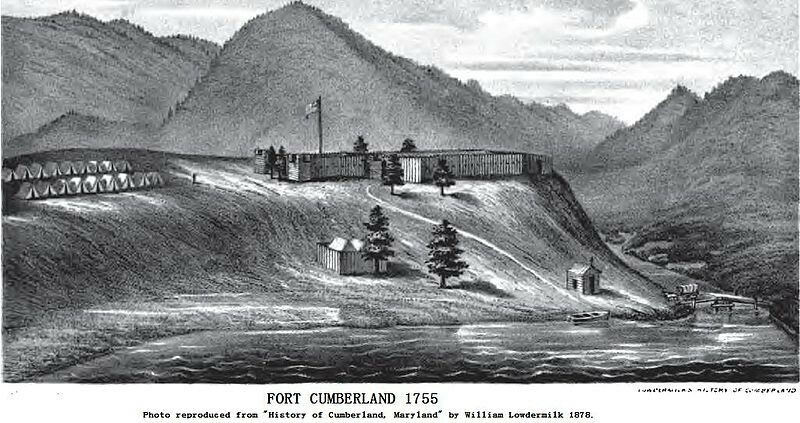 Taking advantage of the topography, they built Fort Cumberland high above the Potomac River in 1754. Since the Potomac suffered from annual flooding linked to snow melts and spring rain runoff, this kept the fort above the “miasma” rich floodplain that surrounded the river edge. In the summer and fall, summer and autumn fevers were possible as well due to the regular downpours that ensued to the south and further west. The most common diseases for this area were the climate and river induced ailments, usually fevers, but also some that were palsy and paralysis related (salmonella, listeria, and meningitis). It served as a connection between east and west, as well as Ohio to the north and the interior of a number of deep south states like Tennessee, western Georgia, and northern Alabama. Later, as lands in the eastern Great Plains were more settled, Cumberland became a pass through for the first trains that made their way this far west. 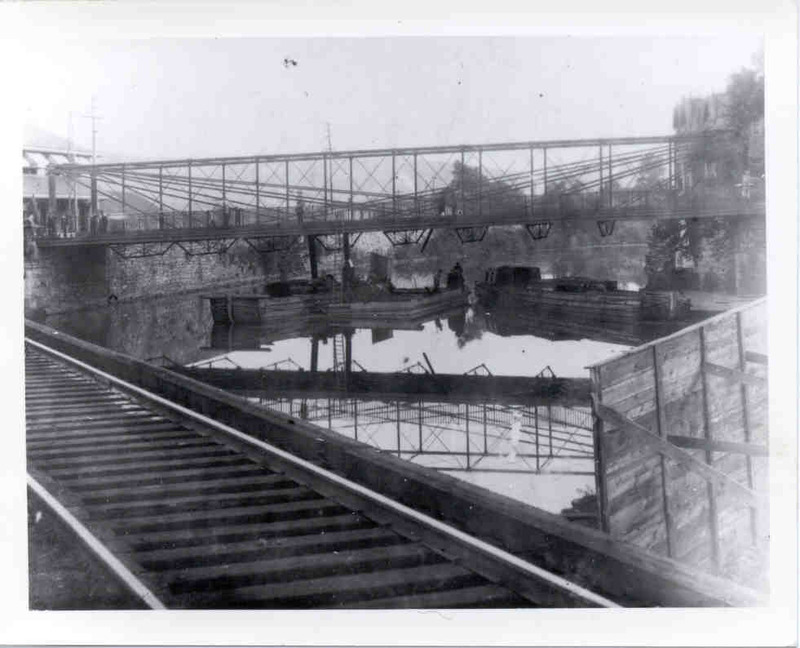 About the same time the trains reached Cumberland, there were canals being built. At first, the hope was that a canal could begin the travels of people turning the town of Cumberland into a densely packed village. 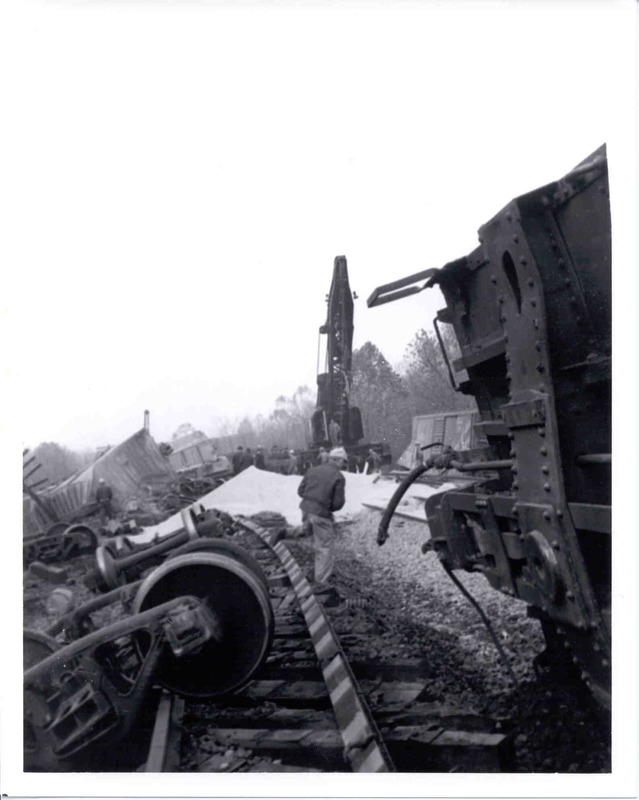 Instead, the railways came to be the choice of travel for people removing to new parts. The plans for a canal continued in spite of reduced financial support, and ultimately became the way Cumberland sent many of its natural resources back east. 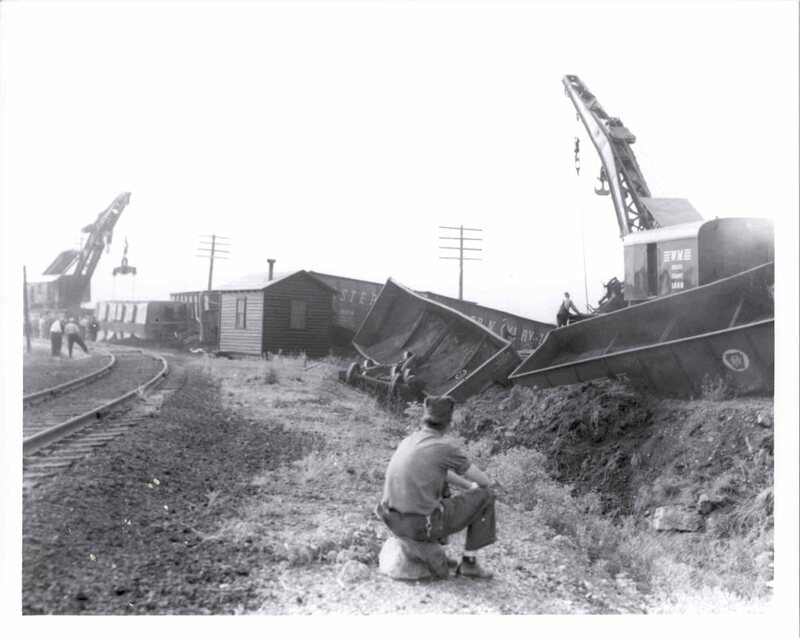 Once the canal and train were finally in place and fully operating, Cumberland was ready for growth. Soon, the town became a small city. But due to many of the prior living habits and accouterments in place, Cumberland became a site for a potential public health disaster waiting happen. This disaster came in December 1889, when people bundled up in their homes for the winter were forced to use water drawn from the Potomac River that was contaminated by their own waste. The whole city had become a brewing place for epidemics during the months prior. As waste and sewage made its way from the streets and small factories into the Potomac, it only needed to travel a few hundred feet to find its way back into the city’s water supply, the pipe for which was situated just downstream. With this water came a bacterium Salmonella typhi, and so to arose the typhoid fever during the months of January through March. By the end of April, the number of deaths were 75, nearly twice as much as the winter before. Dr. William Wyett Wiley was part of a unique generation of physicians that made their way to the midwest with a new medical philosophy at hand–the bacteria theory for disease, introduced a few years earlier, but proven just months before by the German scientist Robert Koch. Dr. Wiley was more familiar with the sanitation theory and the more modern interpretation of “animalcules” as microbes. When the “microbe” was discovered, the meaning of the term “germ” changed. Germ was a very ubiquitous term that physicians gave to their suspected causes for disease. The germ theory, this new version born about 1800, first began to be preached in the 19th century as a more “modern” version of the worm and virus concepts. The virus was an invisible organism. The worm of course was massive, not at all invisible. Small versions of life forms, some found with disease victims, human or animal, were linked to the illnesses the person or livestock suffered. An exact cause was still uncertain, but the visual association between organism presence was obvious present. Dr. Wiley had the skills needed to determine if and when smaller organisms could be the cause for a disease,versus the invisible cause like the virus, and all of the in-between sized causes ranging from infected materials, to physical causes for malaria and contagion. To Wiley, disease did have multiple reasons and ways in which it could be caused. Wiley was in search of both large and small causes for illness, along with human behaviors at home, socially or at work. When Wiley moved to Cumberland and came face to face with its public health, he was familiar with some of the earlier stories about how people in urban settings could become ill. He was no doubt trained extensively in John Snow’s observations about unsafe drinking water and Asiatic cholera. He was more fully trained in the various fevers as well, and had access to some of the better fever medicines of the time. Fevers were broken down more into their unique varieties, defined by hot and cold cycles and what times of the year they tended to behave epidemically or endemically. Wiley knew enough to suspect even some invisible virus like cause to exist for certain illnesses in the local setting. This is why when an epidemic struck the city around 1880, he found it necessary to investigate source, then determine cause, and then cut off the people from this cause, no matter how disrespectful people got about his theories. Wiley was certain, and later we’d find out he was right, about what was causing the epidemics in Cumberland, and other well populated settings. What makes this map different is that it was hand-drawn by Dr. William Wyett Wiley. It was part of his final attempt to convince the people of the town that the cause for the typhoid fevers that just struck Cumberland during previous winter of 1888 to 1889 was the contamination of drinking water being pulled from the Potomac River. The way the history of typhoid is retold, Wiley’s work is pretty much unrecognized as a major accomplishment in U.S. pubic health history. We are most familiar with the story about Mary Mallon (1869 – 1938), the infamous Typhoid Mary, well known for her years as a carrier of typhoid fever during her periods employed as a domestic aid, seamstress, cleaning lady and cook, to name a few. 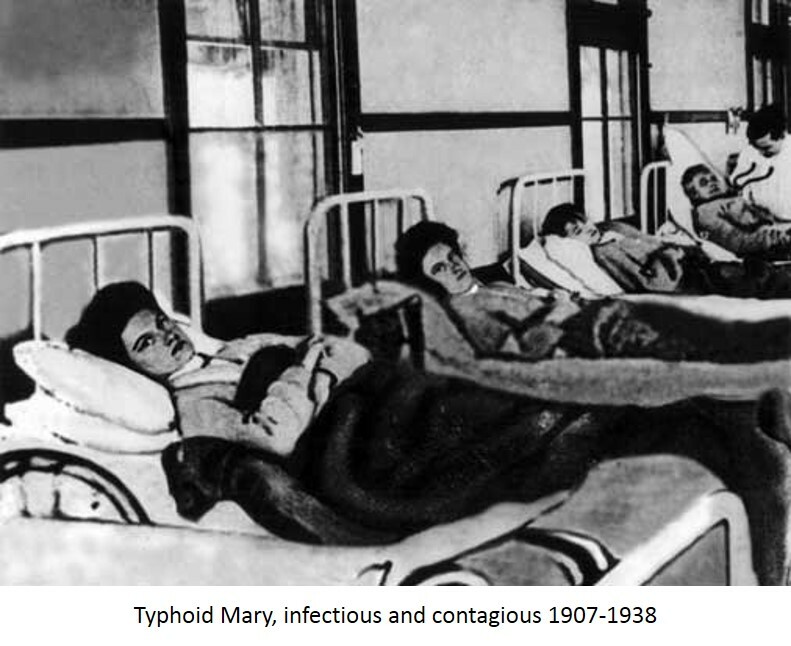 When it comes to epidemics and diseases that can be spread from place to place by carriers, Typhoid Mary is the classic presentation. But before we know the cause for typhoid disease and its ability to be transmitted from one person to the next, we were still struggling with trying to understand its cause. With all of this history in mind, as wel compare Wiley’s discovery of the cause for typhoid in Cumberland, versus the previous discoveries of Mary Mallon’s epidemicity by George Soper, we have to admit, Wiley had a much harder theory to prove. Wiley also had more public disagreements to contend with, and leaders in the field of sanitation engineering that most likely were very much against his new ways of thinking once he moved to the Cumberland area. It was Wiley’s findings however that slowly turned the public perception of water supply and sanitation engineering into the field that it is today. We couldn’t just blindly accept the fact that a large lake or river, constantly replenished by upstream, precipitation runoff and melt, percolated subterranean waters, could always be as safe as we imagined it to be a decade or two earlier. The idea of supplying a city with fresh, new water, not water spent one week ago by a latrine upstream or a little shack in the woods just ten miles away, was a new idea for the largest towns. To pipe water into places like Cumberland meant that a lot of money had to be spent. It was due to these findings and the use of the microscope that was able to understand how the fever striking Cumberland in the middle of the winter, off season for many fever diseases, could come to be. Wiley understood water and sanitation better than the sanitation engineers of this rapidly growing urban setting, and once he posed his theory for why people were becoming ill, he had to contend with the old time sanitarians and the doctors residing in the region. When public health was a concern, politics was still unfortunately a primary concern for local change and local power. For Mary Mallon’s case, the investigation was much easier to carry out. When New York banker Charles Henry Warren hired Engineer George Soper to investigate the source of the outbreak that struck his family, he suspected it had to be Mary. Wiley’s colleagues lacked these insights in to the cause and effect of the same disease seventeen years earlier. When Soper found proof of more cases going back to 1900, she was placed in quarantine on North Brother Island for the next three years. When Wiley found the cause, it wasn’t a single person who could be isolated and quarantined. It was the entire township that was at fault, in particular its way of managing its land use, its water, and the valuable Potomac River that was about to become a canal river. Population growth, shanties, latrines, crowded low income settings upstream from a rapidly growing downtown ended up being the cause for the illness striking the main waterlines feeding into the central downtown city area. With Wiley’s cases, there was an entire population that had to be changed and made safe in terms of public health changes. With Soper’s case involving Typhoid Mary, we only had Mary to deal with. The quarantining of Mary unfortunately was never quite over after this first series of cases. Released in 1910, more cases emerged attributed to her. As she moved from one work place to the next, by 1915 she was linked to more than two dozen cases, until she was finally returned to North Brother Island, where she remained until her death in 1938. By now, the town of Cumberland had smartened up somewhat and the cause for typhoid discovered by Wiley 25 years earlier was just a bit of local legend. Typhoid Mary’s became the rage of historians writing about Typhoid, if not due to her gender then perhaps due to the ring of her name. But Mary’s discovery came as a result of studies like those done of Cumberland by William Wiley, the findings of which was perpetuated by his primary follower George Martin Kober, a journalist and correspondent living in Washington DC who made Wiley’s work and discovery well known. Where Typhoid Mary serves as an example in how to managed people and disease, and the idea of quarantine, isolationism and protection of the public at large, Wiley’s work represents the ability of the physician to manage the health of an entire town, city or region, without turning to isolationist, quarantine like practices. 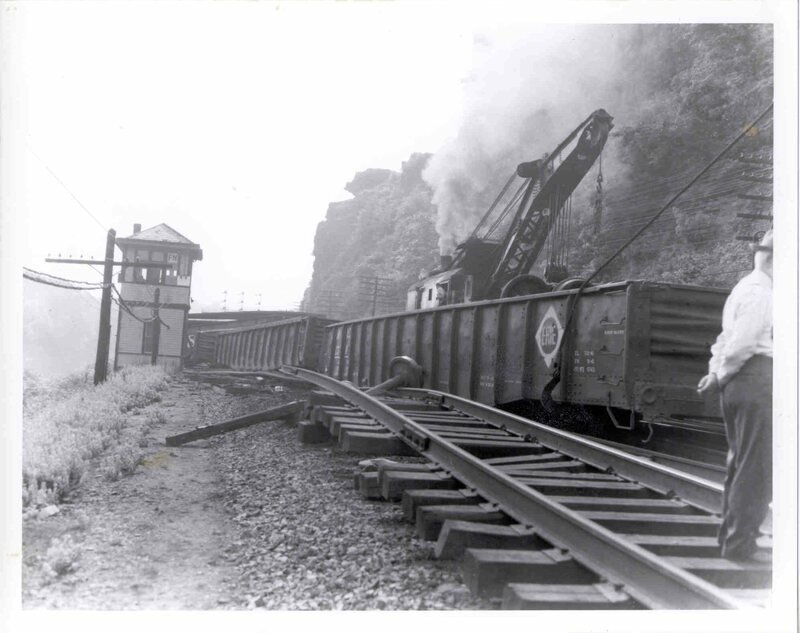 No stone walls had to be built around Cumberland to stop the epidemic from happening. The town and city need only change its sanitary practices and recognize that water is one of the most essential natural resources that a city can have, which when put to good use for reasons other than domestic purposes, has to be regulated and monitored in order for the local people to remain healthy, not te mention the dozens to hundreds of towns residing downstream, all the way to Washington, D.C.
Just prior to Mary Mallon’s story was William Wyett Wiley’s work on the mapping of typhoid in Cumberland, Maryland. Cumberland became a typhoid town in the winter of 1888 to 1889. What turned this particular winter into typhoid season for Cumberland was the weather nearby. Recent droughts plagued large parts of the region upriver from the city. This made the Potomac River quite low. Then all of a sudden, the weather pattern change and all of the accumulated sediment, debris and detritus gathered made its way downstream with the headwaters. Some of this debris snagged onto the ends of the pipes that fed into the Potomac from Cumberland. 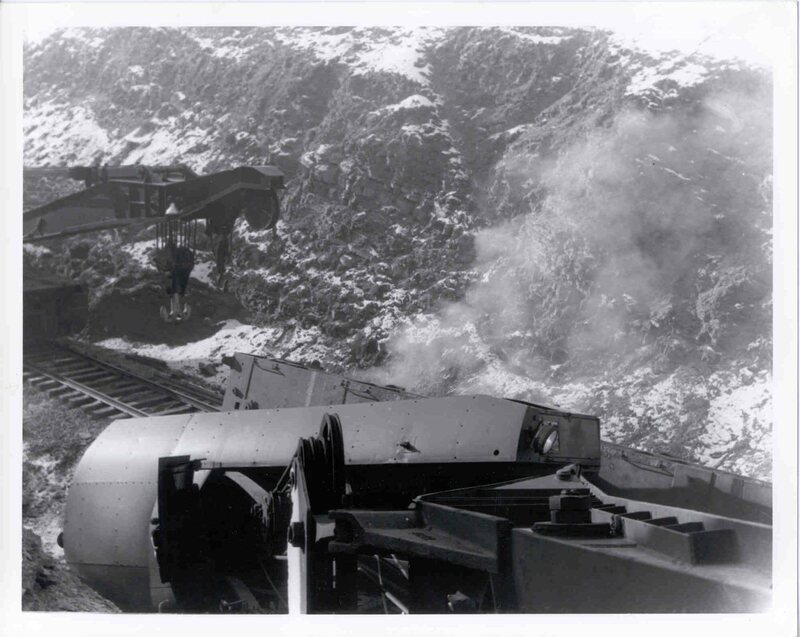 Large logs and rolling boulders struck the ends of these pipe crimping them at their edges, turning some a full 90 degrees with their ends now pointed in the wrong direction. As debris flowed by these it filled them partially, with branches, grass and mud forming packs of sediment that serve to block off their connection to the river. This process essentially stopped the flow of water in every direction. 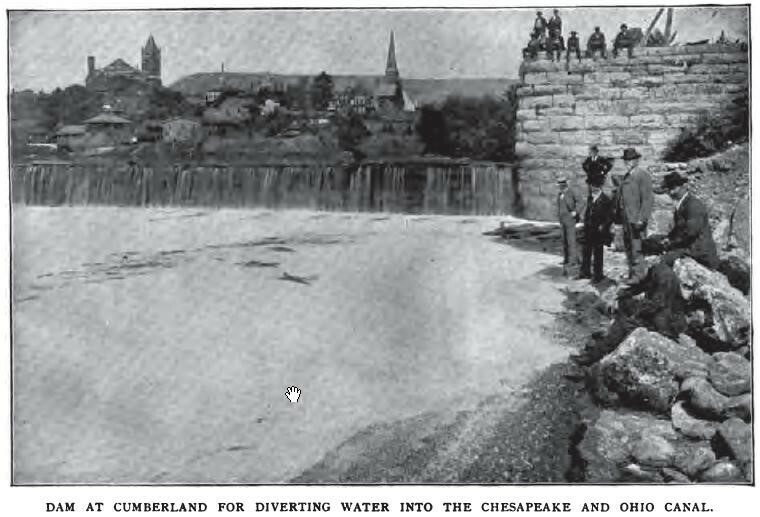 This meant that the sewage from the city of Cumberland had few ways to go and that the inflow of water from the feed pipe located across the river would no longer provide the city with its much needed water supply. As a result of this, the sanitary and water engineers opened the secondary water source on the Cumberland city side of the river, where a garbage dump sat along the shoreline just several years away and where swine often hung out in search for feed and muddy fields to crawl through and leave their waste. This crudely worded description of the Cumberland side of the river is not enough however to explain fully the condition this part of the city was in by this time. In addition to all the detritus and debris searching for new place to settle, was the population itself on the mainland, which had been changing in the region for a number of years. This population was now nearing its maximum density in some places, neighborhoods where it became likely for water contamination to set in upstream along the rivulets and creeks that fed into the Potomac. The new land uses for the region included the expected farriers, hogs pens and cattle barns, but also included rows and rows of shacks built to support the people working nearby s miners and other natural resource field workers. 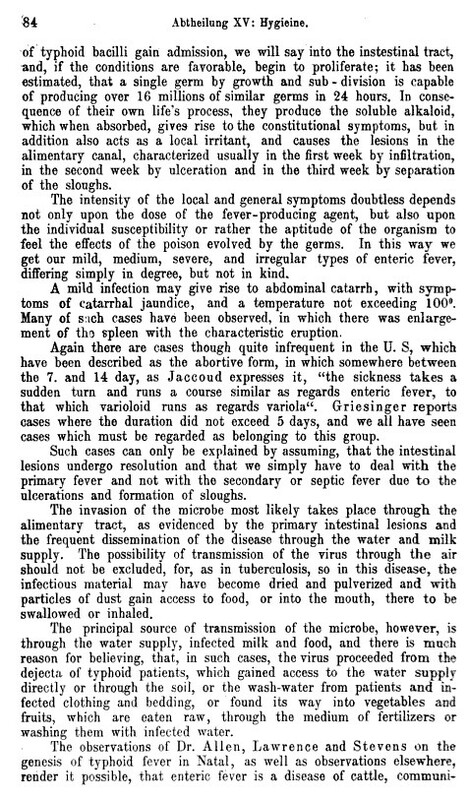 In a review of this story of the discovery of the local cause for typhoid, by an associate of Wiley, George Martin Kober, a physician from German who was working as a medical newswriter in Washington, D.C., Kober recalls this uncertainty he and Wiley had about the cause for this epidemic. He explained that they went through all of the possible options based on the older theories. The common question for the time is was this disease a result of any bacteria that might be found? Or was the discovered microbes the cause for the disease? There was also a third opinion making its way throughout the medical literature, which stated that bacteria were indirectly the cause for disease, due to the toxins that they produced. The physicians arguing this claim did not want to totally eliminate the older theories out there–one of which was a toxins theory, though not necessarily requiring microbes. Reminding us of the older effluvium or miasma based theories, in a contribution he wrote for the German publication Verhandlungen des X. Internationalen Medicinschen Congresses, Berlin, 4.-9. August 1890. 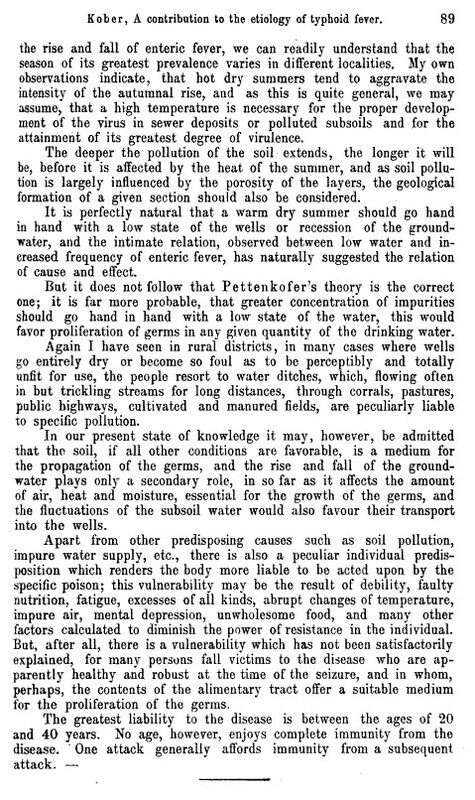 Band V. . . . Hygieine (Berlin, 1891), he recalls his discussion with Wiley about the river water being the cause. But they together also considered the possibility that “putrid gases” emanating from the river and its sewage could be a cause, or the air that is long exposed to long to this material. The nature of the soil was also considered, and the ability of soil to pollute the drinking waters. Still, this focus on “soil pollution”, as they called it, with its relationship to “kitchen and slop waters” wasn’t enough to convince himself that there was anything other than bacteria that could be causing this outbreak. He noted the inability of nurses in contact with patients to be able to spread the disease to other ward rooms. He found other places where outbreaks occurred, and where the soil was totally different from the soil in Cumberland, which had its unique micro-organism favoring characteristics. Time and time again, both Wiley and Kober convinced themselves that only bacteria could be the cause. Their low income home settings consisted mostly of shanties set up along the local drainage creeks, with toilets places right over the ditches that flowed by, emptying into the Potomac. The largest and most densely population of these ditches was an actual creek that fed water into the Potomac most of the year. 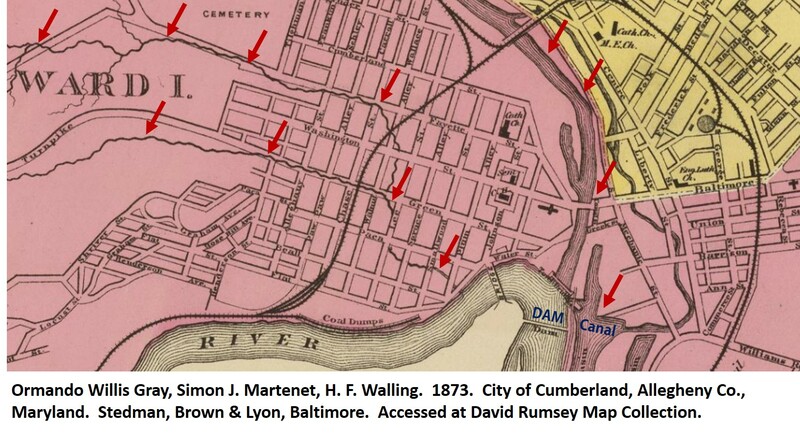 A map drawn of this part of the city also shows us that this place in the city edge sent its waste downstream into a river that suddenly stagnated once it carried this debris further downstream to the dam built across the Potomac next to its downtown. Even if the water itself was not bacteria ridden, due to a cleansing from recent rains, the soil made it possible as well for bacterial disease to make their stay between rainfalls. A period of drought no doubt left the smaller rivulet ditches high and dry much of the season, meaning the sewage left behind by families would lie there until the next outwash period, covered with dirt, grass, leaves and lime to keep the stenches down. One such use had to deal with the non-sanitary establishment of privies or toilets, wells and other water supplies, all along the flood plains of the Potomac River. Since soil was the means for certain diseases to be spread or developed during this time, the varying amounts of rain and the ways in which these rains fell resulted in either the purging of soil of its causes for disease during the heaviest downpours, or the enabling of certain diseases to infest certain small areas while waiting for the next opportunity to rise and find their next human victims. Such is exactly what happened in Cumberland, Maryland in late Autumn of 1888. The year or two of local drought and relatively dry weather, followed by the right temperatures and precipitation, paved the way for typhoid epidemic to emerge in this city during the winter of 1888 to 1889. This was the same winter than the same epidemic had just stricken another part of the country, Rhode Island, where it was determined that underground water contaminated by human waste was the cause. Doctors were now on their way to understanding the cause for some of the worst epidemics yet to prevail regularly in certain rapidly growing urban settings, regardless of latitude and season. Typhoid fever did not require the warm climate requirements seen for yellow fever and cholera the decades before. Nor did it occur in reaction to in-coming ships. It ensued due to population density change and the overall non-sanitary living conditions that some parts of most cities in the U.S. bore as a consequence of population growth. To put this into perspective, it helps to understand the theory of disease prevalent during the decades before. 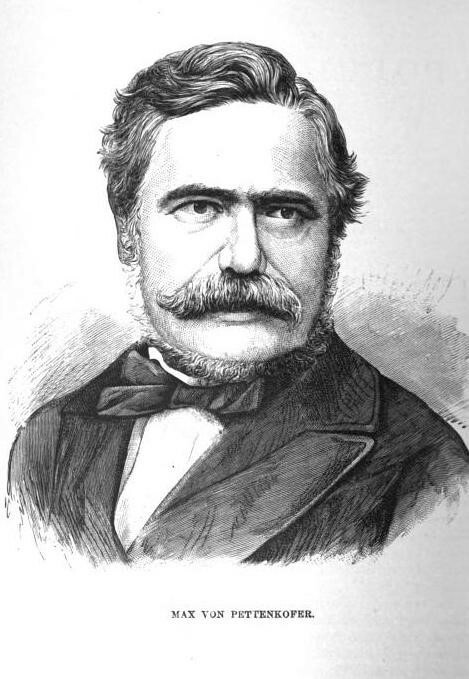 By the mid-1800s, Farr’s zymotic theory had taken over the role which the generic “miasma” played in disease philosophy. Miasma was perhaps too targeted by this point in time, and not enough evidence was there to show how some forms of the miasma did indeed have very specific causes or parts of the miasm needed to define the cause for the disease. The virus of certain forms of miasma closely linked to chemicals could not be differentiated into each of these two causes as we know them today. Farr’s zymosis fit the behaviors of disease and its success with the vaccination process for the time. Some diseases could very easily be vaccinated against, others that mimicked them simply could not. Cholera behaved like other forms of diarrhea and fever, but only certain forms of fever and the dysentery were preventable through vaccinations, and cholera wasn’t one of them. Nevertheless, Farr noted that the way in which cholera spread was in many ways like the other diseases vaccinated against, and so placed it in close proximity to these in terms of their zymotic nature. The various forms of zymoses or zymotic diseases became just as difficult to differentiate as the various forms of miasma produced by nature, so common to the literature years prior. But then the microbial theory came to be. In the 1870s, these small organisms or animalcules were the suspected causes for many conditions. This knowledge of disease behaviors relative to the places these microbe lived, in the water, pretty much paralleled the philosophical teachings for the sanitation theory for disease that was around as well. All of these theories were now coming together due to the late 19th century findings, just before the microbes under already observation by a microscope were for the first time linked to certain disease types. Once this latter discover was made around 1881-2, zymosis would begin to disappear from the texts, and the term microbial ultimately replaced by bacterial. By 1890, one generation later in terms of apprenticeships and medical school training, the oldest members of the profession passed, and leaving with them were their topographic and climatic theories for diseases. The medical geographer’s “miasma” perspective was gone forever, almost, as defined by the classical swamp gas, the smell of decay emitted from dead animals, the smell and sweat of an ailing person’s body, the electric fields of the earth and magnetism defined by Faraday, the emission of certain volcanic gases from its core, the radiation of health and reflected light and energies from its steamy and rocky to magma interior. Disease was now believed to be due to physical objects that we could identify using a spectacle or microscopic lens. The agents that caused disease sometimes made the waters muddy or mirky, othertimes it remained invisible. With the sanitation theory now prevailing, we know how to search for these clues for illness in the drinking water. This defined the fate and events that were about to take place along the Potomac in Cumberland in 1888 and 1889. Cumberland was once of the first places where the new bacterial/microbial/germ theory for disease could be tested for, and proven. The Potomac at this time was a clear water river, but barely clean in the common sense of this word. It was the receptacle for the waste disposed into it by the people of Cumberland and those living upstream from this area. It had already received spillage and pollution from a number of towns and cities further inland. Were it not for the mileage between these neighboring towns, things could have been worse for Cumberland. But the causes for the typhoid in Cumberland did not need the assistance of any microbes in the water generated further upstream. The locals living in this town had every needed for Cumberland to turn the Potamac into a cess pool rich in invisible pathogens waiting to find the next way to make their way into peoples’ drinking water. When Typhoid Fever struck the town of Cumberland, Dr. Wiley had enough of the newer training to develop a theory as to its cause. When the large numbers of cases and deaths ensued due to this disease in winter of 1888-9, Wiley’s plan was to determine and provide its cause, and then make this discovery known to the local public. But even after convincing himself of its etiology, Wiley was unable to prove his claims to the people or the government of the local city. In short time, Wiley became a very frustrate doctor with the newer training in medicine, and would ultimately make important contacts with people back east to describe his claim. 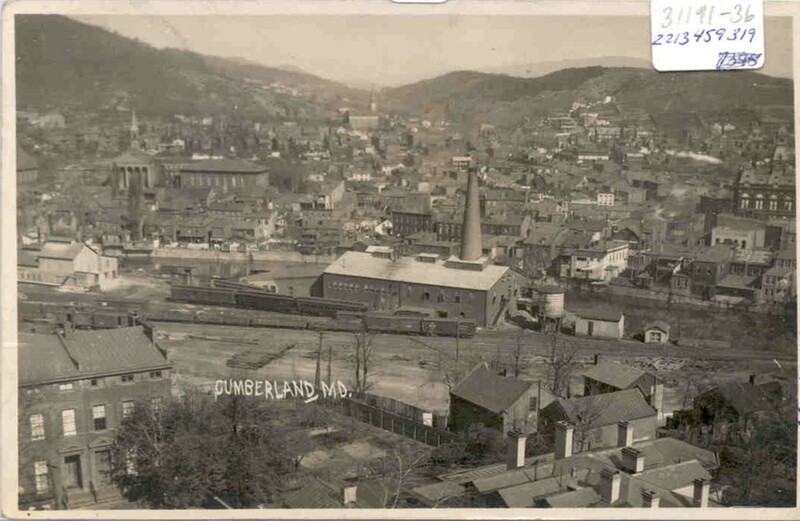 Wiley claimed that in winter of 1889/1890, privies and excrement impacted the health of Cumberland, Maryland by infecting the city’s water supply and causing typhoid fever to erupt. Much the same would finally become proven without doubt just a few years later. Still, the contemporary, fame that typhoid has comes from Typhoid Mary–an issue that arose decades later. Typhoid Mary perhaps stole a lot of the attention Dr. Wiley and his discovery should have received, a product was research into medical history weighted by ulterior motives and personal agendas, the desire to rewrite history, to make amends for all the prejudice that lie in United States culture in the past. Geography was excluded from the American school system soon after, and so too was the value of geographic analysis in United States schools, traditions, work related skillsets, and cultures. Wiley’s work remains one of the best examples of how cartography can be used to make your point in epidemiological research, before our heads were turned in other directions during the 20th century by people who forgot what geography was or what it meant for studying places and peoples’ health. One classical lesson we can all walk away with regarding the typhoid epidemic in Cumberland is that use of a hand drawn map is sometimes all that is needed to prove a theory. In a west nile outbreak a decade or more back I used a simple local map to define where the disease came from. In my thesis on the history of cholera on the Oregon Trail, I used maps to demonstrate how much error is being published by history writers, especially those with such little knowledge of this disease, the past use of the term cholera versus its modern day meaning. The malaria of today wasn’t what we think of it as now, back in the mid-1800s. Yet historians continue to state that such a condition prevailed in certain settings by misreading and not knowing the true use and meaning of that malaria, a name given to several diseases that behaved a certain way spatially in the regions that were afflicted. With knowing at all much about what the typhoid bacillus really looked like or even how it behaved, Dr. Wiley showed that something invisible to the eye could be the cause for disease that was related to contaminated water making its way back into the city’s water supply. He used a map to make his point, but a full knowledge of past and present findings about diseases and their causes to formulate his hypothesis, and pull a stunt similar to that of John Snow, walking right up to the pipe that was the cause for the epidemic and pointing his finger to a cause that nobody else was willing to believe. However, this tale of Wiley is also not just another one of those John Snow stories we occasionally read about, again and again. Snow gave us a way to see how maps prove beyond a doubt that a particular place can be the central cause for a disease pattern, which we modernize in our understanding by imaging the bacterium residing in that water, an organism Snow knew noting about, much less its likelihood for being the cause. Some historians speculate that Snow was lucky in fact by being able to make this association. I myself, in a recent commentary on another piece of medical geography history related to Snow, showed us how blinded we can sometimes be to our own hypotheses. In Cincinnati, Ohio, a non-physician John Lea wrote out his theory as to how chemistry, alkaline rocks and soil and alluvial settings made it possible for the vibrio responsible for cholera to infect people. Snow contested this. Snow was wrong. Lea’s claims would be proven correct more than 20 years later by a Japanese microbiologist, by which time everyone forgot Lea’s original discovery of this particular aspect of the disease, which we related to the pathogen. Snow’s and Lea’s maps of cholera were a bit more complex, and being decades earlier in origin, drawn up based on another theories for disease, more than forty years before Wiley drew up his own map. The traditional miasma theory for disease was changed by Snow’s time. The word remained, but its varying definitions were now quite different, as detailed in my review of Canstatt’s work. In the decade before Snow’s map, we see the theory of miasma develop into one that used this word generically to refer to causes of all nature for disease, causes summarized by the disease taxonomy designed by German medical topographer Canstatt in 1847 and applied symbolically to every natural cause then proposed for diseases. It was these different causes that turned an illness into either one consisting of fever or diarrhea, lethargy or nervous excitement. Such a theory proposed by Canstatt was not necessarily exactly the same as that posed by Snow, but it included the causes for diseases which mapped like those of cholera in the mid-19th century, and the cases being studied by Snow. Typhoid was different from cholera in several ways, the reasons for the delay in discovering its cause. It bore fever as one of its chief symptoms, and for a while was lumped together with its typhus, a disease of completely different origins and methods based on today’s knowledge of these two contagious conditions. Both were signs of poverty and poor sanitation, but typhus was rodent induced, and involved fleas usually. Typhoid on the other hand was due to a bacterium, and did not need rodents to be dispersed or transferred to new regions. The complications of typhus were of a different form that those of typhoid. Later, as these differences became better understood, the name of the diseases were changed to better describe their obvious differences. Typhoid and typhus weren’t their own unique entities until the late 1800s. 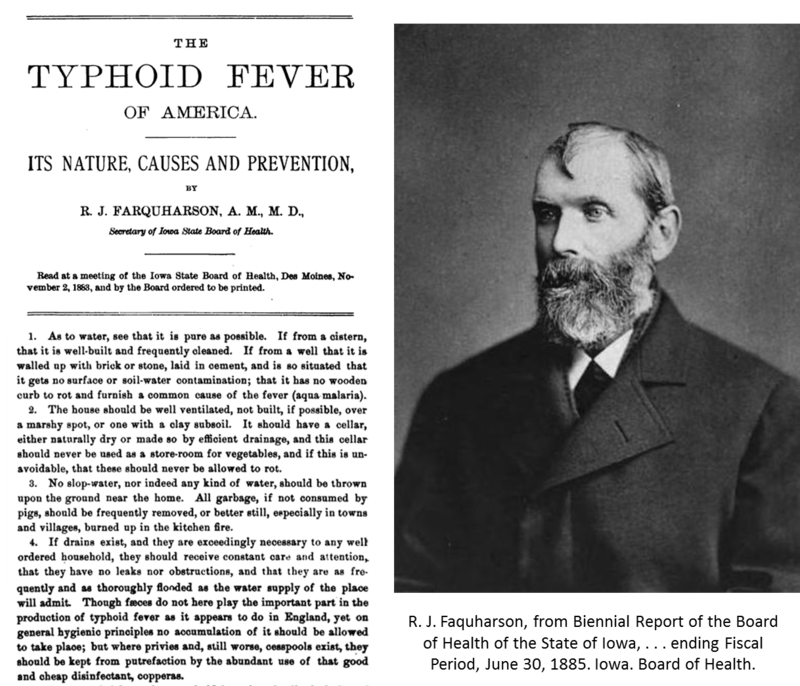 Faquharson’s The Typhoid Fever of America of 1883 showed how these differences were becoming better understood. R. J. Faquharson, from Biennial Report of the Board of Health of the State of Iowa, . . . ending Fiscal Period, June 30, 1885. Iowa. Board of Health. When the typhoid fever epidemic struck Cumberland during the winter of 1889 to 1890. It was no longer the same problem as typhus, dysentery, or other similar conditions were causing. the difference between these various epidemics were by now better understood. To Wiley, the numerous privies or outhouses along Wills Creek and the two smaller creeks feeding the Potomac were the cause for this public health hazard. This set up accompanied by a lack of adequate planning for land use changes by local government were the main reasons the local typhoid problem was a major public health disaster. 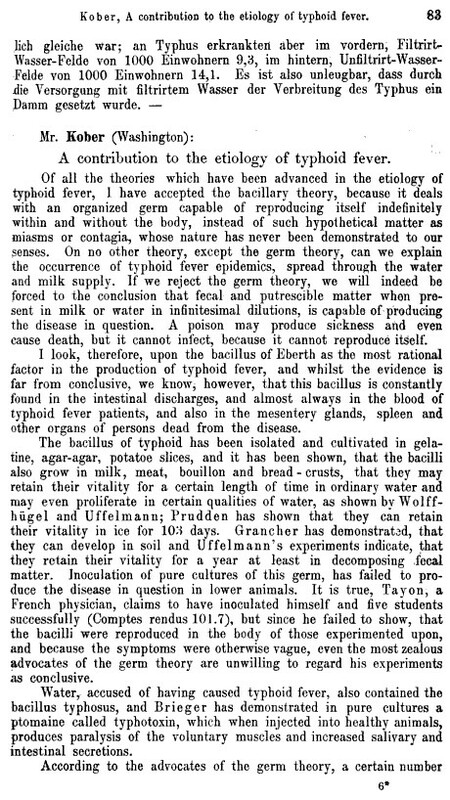 What is most important to note here is that Wiley’s map of typhoid is the first map used to support the proof of the microbial/bacterial theory for disease. The earliest maps of disease such as Schnurrer’s maps depicted health as a consequence of latitude, climate and local weather. Two other maps that followed by German physicians Heinrich berghaus and Adolph Muhry also relied mostly on climate features to explain disease, although by the time the 1830s had arrive, topographic features were known to influence local disease patterns as well. In 1798/1805, Valentine Seaman’s epidemiological map was more of a case study map, as was John Lea’s highly detailed map from 1850 demonstrating how specific regions can cause cholera due to the condition, exposure and substratum chemistry of the geology around drinking wells. A more population focused map by John Snow depicted the consequences of population density and the locations of cases in relation to drinking water courses. Neither of these two map, nor most of the maps on cholera published about this time told us enough detail to define a cause for the disease locally. Regionally, these maps sometimes provided even more problematic insights if and when they were used to defined causes based on anything other than human transportation. The maps of Alexander Keith Johnston, John C. Peters, Robert Hamill, William Aitken, and others did little to move away from these two previous interpretations we developed about disease and place. During the 1870s, it was the small area mapping of epidemiologists in search for a specific cause of diseases like typhoid and malaria fevers that finally made the map an investigative tool, a use for a map that Wiley took advantage of with the Cumberland typhoid epidemic. His hand-sketched map turned medical geography into a science that studied chemicals, microbes and minutia using maps, not just winds, storms, weather and land surfaces. 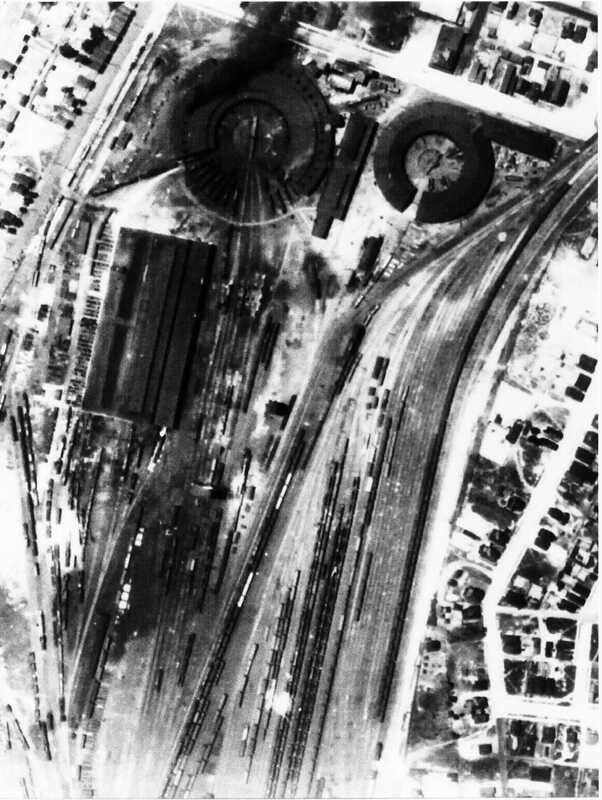 It was preceded by maps that illustrated the detail of the dairy barns where certain fevers prevailed, or the maps of city settings where garbage ridden alleys were culprits for disease. Wiley’s little map added the final proof to doctors that maps were needed in order for their profession to advance into the twentieth century. 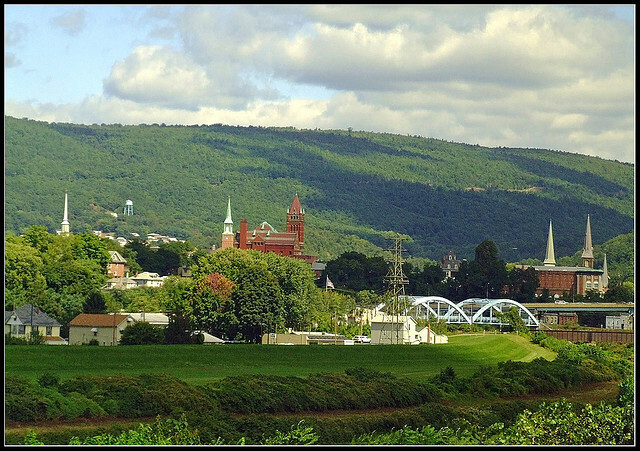 Cumberland is a riverside town that served as a link between the Eastern and Western Alleghenies. 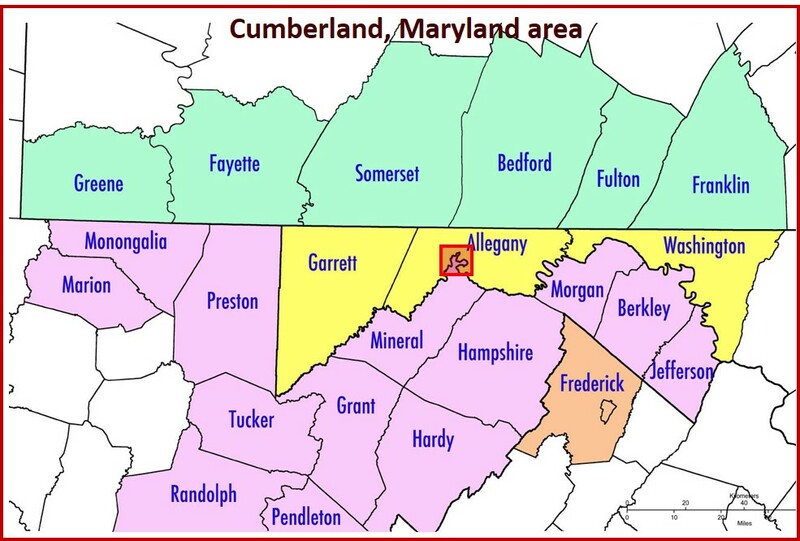 In 1800, it formed the western part of a Maryland that was barely settled. 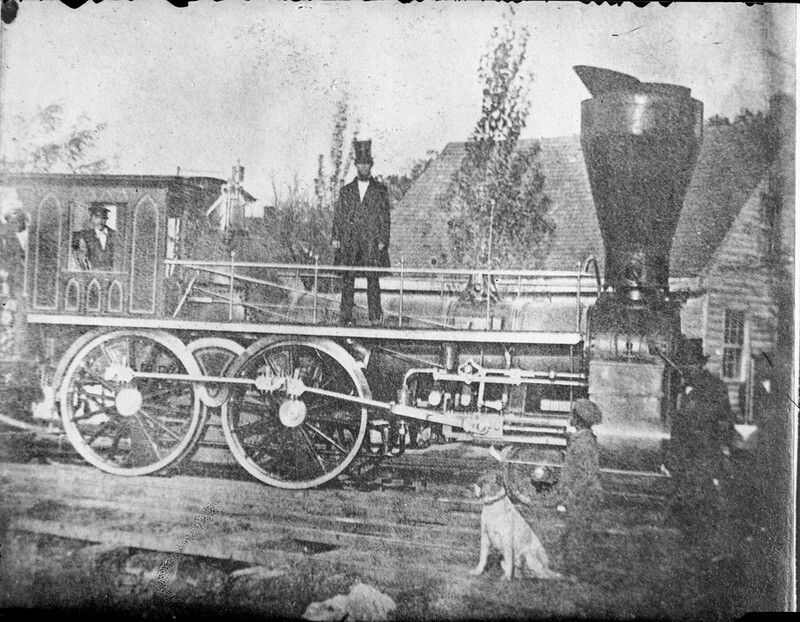 By the mid 19th century it was the primary way to travel west from Philadelphia and cities to the south. Fort Cumberland was built in what is now Cumberland during the mid 1700s. It was no place to brag about. This fort rested atop a large plateau overlooking the Potomac River. Safe from floods and such, but difficult to engage in any commerce with. Adjacent to it were a few pioneer settlements, also overlooking the river’s flood plain. There was also a roadway of sorts, just one, and it led you to Fort Cumberland. Every few years this roadway would change. This was due in large part to fallen trees, erosion, wheel ruts that were carved too deep, and the poor drainage of the roads wherever they passed through swampy fields, riddled with sinkholes, and covered by mudslides or outwash due to the spring thaws. The trek to Cumberland was in every way a test of your patience, persistence and sanity. But it was the only way to get this aprt of the country, so generally speaking, you had no choice. By the late 1700s, a hamlet was forming along the edge of Potomac River. Its center was where Wills River flowed into the Potomac. Unlike the Fort, this hamlet was riverside and more exposed to the influences of nature. It was the seasonal floods that most often caused disturbances, accompanied snow melt, flooding and sometimes the submergence of private property, home, horse and all. In the late summer thunderstorm season, thunderheads were typical, tropical storms rare but devastating. Along with this abundant supply of water sometimes came pestilence each time. Flooded floodplains enabled the contents of privies to mix with the well water. Sand and gravel aquifers beneath the soil surface made for rapid drainage, but also allowed cross contamination to ensue at times. During the late summers, rains made some parts of the region highly susceptible to gnats, deer flies and mosquitoes. Dead animals littering the shoreline served as the source for much contagion. As the summer seasons approached, anywhere that sedges and rush grew produced foul air, which in turn attracted more flies and mosquitoes it seemed, and led to more diseases. When the weather was just right, what few outhouses existed in this sparsely settled area, were enough to plague the floodplain with a foul odor and outwash from the privies. This caused occasional spells of dysentery and such to erupt. Depending upon the commerce at the time, occasional diseases from elsewhere in the country or world might happen into the area. The better the commercial traffic, the more likely this town would become infected from others settlements downstream along the Potomac. As a young riverside hamlet developed into a small village, and then a town, new diseases took hold of this region according to plan. To Dr. Benjamin Rush of Philadelphia, Cumberland was very much a pioneer region maturing into a small farming community. This meant that the diseases expected for such a setting were going to be due to the topography of the region. He and others would have expected the typical august and summer fevers, with remittents and intermittents occuring in between, and with occasional seasonal constant fevers present in the winter. Diarrhea was present, but usually not bad enough to become full blown dysentery. Bilious fever and the more advanced yellow fever were not at all common to Cumberland in the 1790s, nor would they impact this region much for decades to come. From 1800 to 1825, Cumberland remained a region devoid of much settlement. Its most important attribute was serving as the halfway point between the east coast and the midwest. This meant that it was a convenient place to settle for the night, for those heading from one big town to the next, heading east or west. This region also served as a traditional layover for those taking the Old Cumberland Road connecting the Fort to the cities and vice versa. With few travelers, only a few accommodations had to be made, that is, until new commercial ventures were discovered. In 1825, all of this barely-tamed wilderness around Cumberland area was toppled to build a large number of houses. Cumberland village had been established. Between 1825 and 1830, the population of Cumberland Village, and later City, rose from just a few hundred to a little more than a thousand. 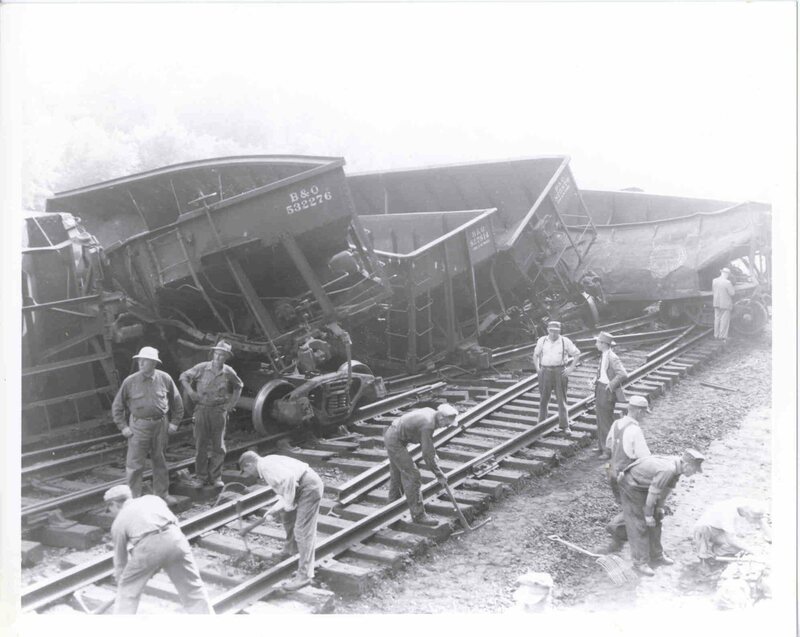 For several years, as plans were made to turn Cumberland into a crucial link between the coast and the parts of eastern Ohio on over to Indiana, railroads were being developed back east, and the first major canals were being built. Both of these means of transportation would ultimately change Cumberland from a shanty village to a sizeable framehouse-rich homesteading region. Once a stopping point for travelers much of the time in the earlier years, Cumberland was now an end point for others, a place to make a living. As hotels and more dining places were opened, more mercantile businesses were established, and Cumberland entering the next stage of its development according to the famous wartime and post-Revolutionary War physician Benjamin Rush. In 1786, Benjamin Rush gave a lecture to some physicians in Manchester, England. This lecture was about the changing hamlets, villages and town in the newly established United States. Rush noted that particular lifestyles prevailed across the country. He noted the well developed metropolitan settings, versus the large farmsteads located just outside the cities. In the rural setting there were family-sized settlements, with just a few board houses and plenty of wilderness nearby. Finally there were the hinterlands settlements, where mostly the natives lived and those willing to risk their lives set up log cabins and primitive homesteads. Each one of these living areas played its own unique role in the growth of civilization. To Rush, each of these stages of development formed what he called a new “species” of settlers. The different “species” residing in the region posed to their government a different set of needs, in terms of supply and military assistance. The inference made by Rush, although not outwardly, was that with each region and each lifestyle came a unique class of people with a unique set of health related features. He implied this by differentiating the urban from suburban, countryside and wilderness folks by the use of the term “species”. 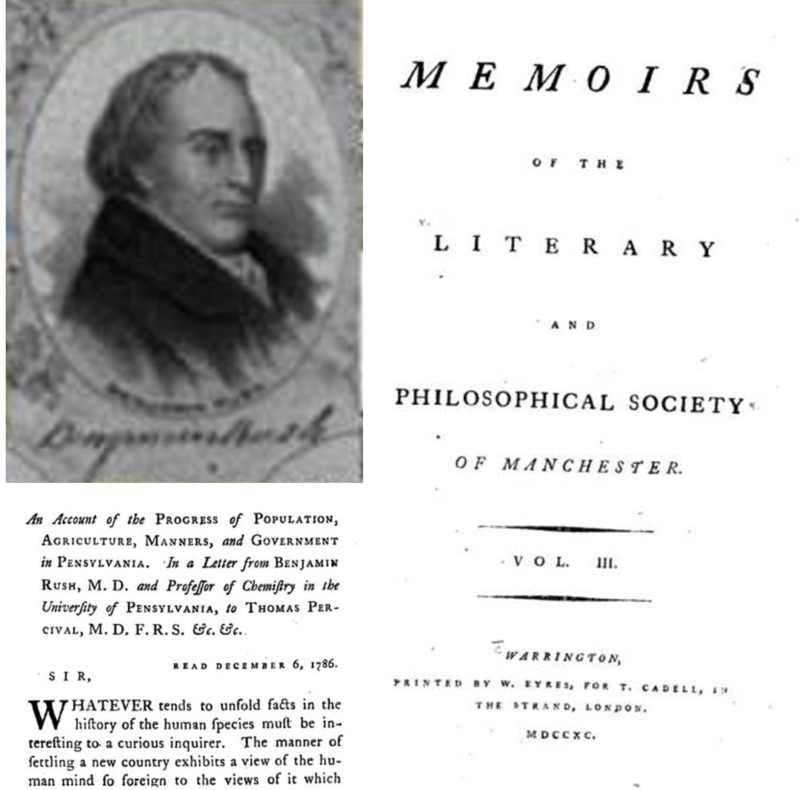 Being the pro-Linnean that he was, like any well educated scientist, and a supporter of the first Darwinian concept of evolution and development posed by Erasmus Darwin, the grandfather of the great Charles, Rush same people growing, maturing and evolving in much the same way as a land burdened with natural resources and animals might be. Taming the wilderness was the first step in advancing any region Rush and others were thinking. Pastoral thinking was required of anyone attempting to settle previously unsettled terrain. The maturation of mankind itself required these kinds of changes to happen. In order to happen, we had to leave older lifestyles behind and take on new ones. This also meant leaving older risks behind, like exposing ourselves to too much miasma in the wilderness, by filling in those marshes, swamps and small ponds whenever we could, preventing diseases from coming in, eliminating ailments considered natural to the region. Cumberland had just gone through three of these steps to becoming an established city by 1845. The addition of the train and canal boats to this city would make it a climax species in this evolutionary interpretation of the population masses, so designed by Rush. Cumberland had all the makings of the perfect human ecology for its time in 1845. There was the city center, its perimeter borne by working class, the adjacent farming communities and their products, along with some very basic natural resource settings focused on the value of minerals and mining. The Fort and Log Cabin like setting was pretty much outgrown, except next to the coal mines that were now becoming most productive. And the nearly mines for slab, stone and minerals were a rapidly growing group of industries as well. 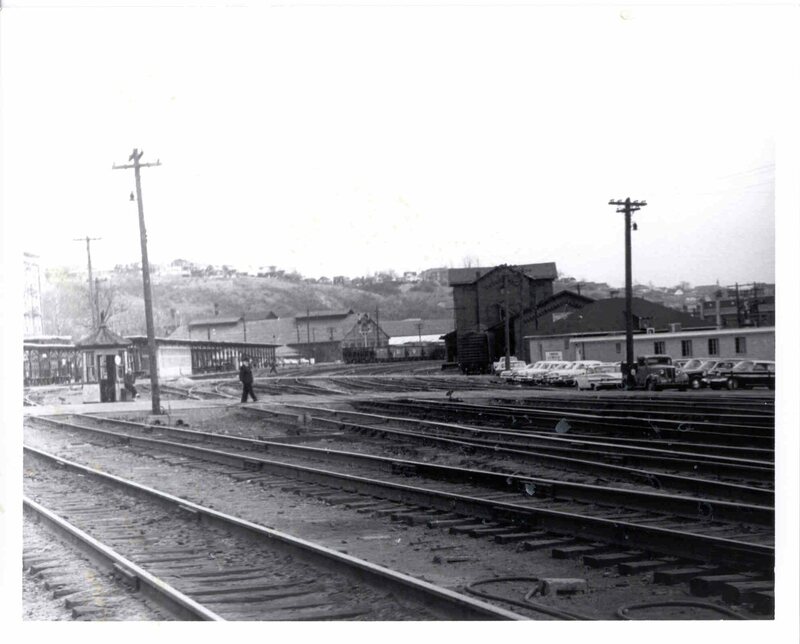 Cumberland was the core place where all of these commercial enterprises met, to produce new contracts, and make new sales of whatever unique resources they had to offer. 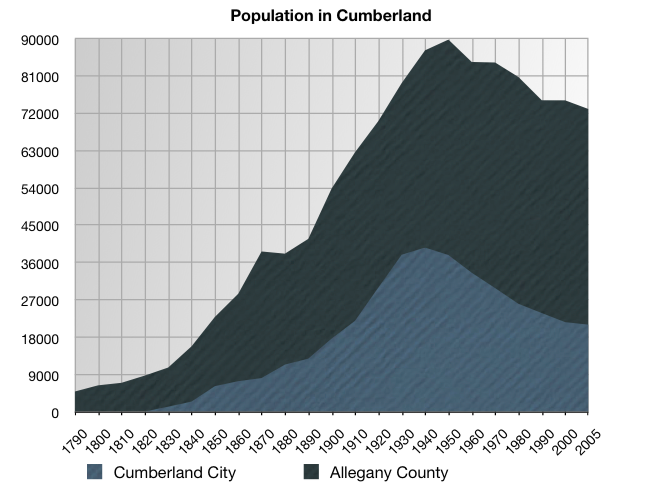 So, by the mid-1800s, Cumberland had become a town setting with more than just self-supporting farms. Cumberland is still this way today. By 1845, Cumberland was a place where new diseases could develop as well. Yellow Fever in particular was the most likely to visit this territory according to prior events and experiences. But few knew that the yellow fever had reached its peak in evolution in the United States. It was an effective, conquering disease that came into shipping ports between 1792 and 1824, but had significantly lessened in its outbreaks every since. There were also the dengue and spotted fever to content with, and ship fever was always around as well. The causes for each one of these fevers was very much unknown. But the different topographic requirements for each were well documented. Bilious or yellow fever we know came from shipping harbors. Its cause was not identified, but its regional economic requirements were interpretable. Both dengue, or typhus, and spotted fever, came with lesser frequency, but equal force whenever they impacted the human body. There were still the classic disease patterns to contend with as well in Cumberland. Intermittent and remittent diseases form of disease related to mal aria were still evident. A recent new comers, was ready to makes its second entry into this country about this time, having first impacted the United States in 1832. The stench of farm animals was still in its intermediate farming stage. Currying, tanning, cattle industries were now in their fastest growth stage, as homesteading was now being replaced by permanently settled houses, often rather poor quality shacks placed about the city’s edge. The city as also surrounded by farms and husbandry settings. In the hills were the mining industries and stoneworkers. Metalwork could also be a popular pasttime here. The mixed resource producers were also abundant, especially wagoneers, wheelbenders and some early furniture makers. The future of Cumberland seemed good by now. By the late 1830s it was a town with many large businesses being established. One such business was the establishment of mines for investors back east. 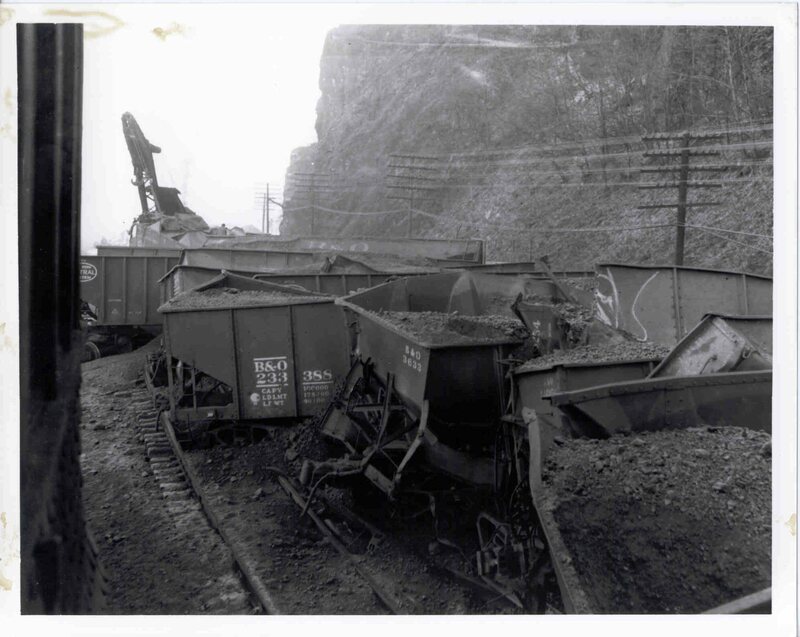 Coal and other mined goods could be obtained from the nearby mountains., and in just a few years coal became the primary resource. 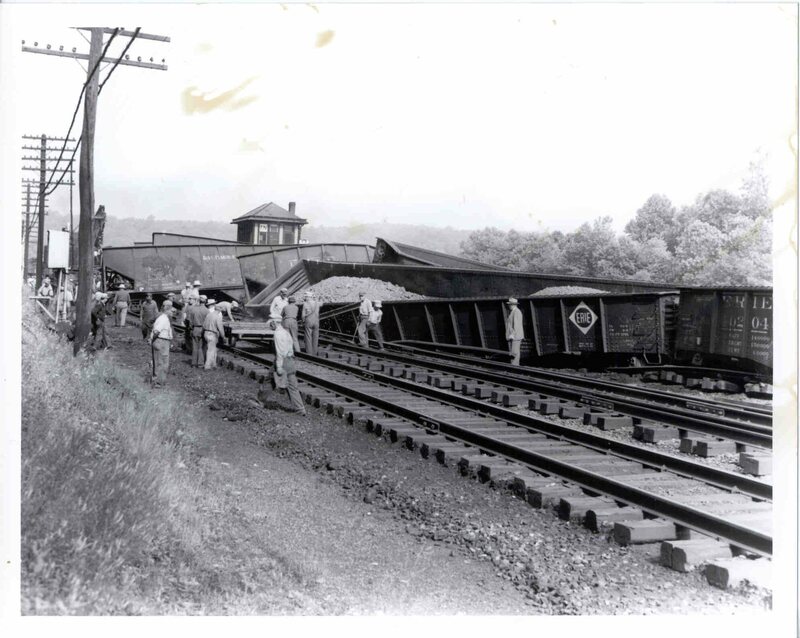 Routes were being established for the sale of coal up north in Ohio and back east in Pennsylvania. It was about 1840 when the old Cumberland Turnpike became a heavily traveled roadway. Supplementing this means for travel were the railroads opened in 1820s and 1830s, now well into their mature state and increasing in almost on a daily basis. 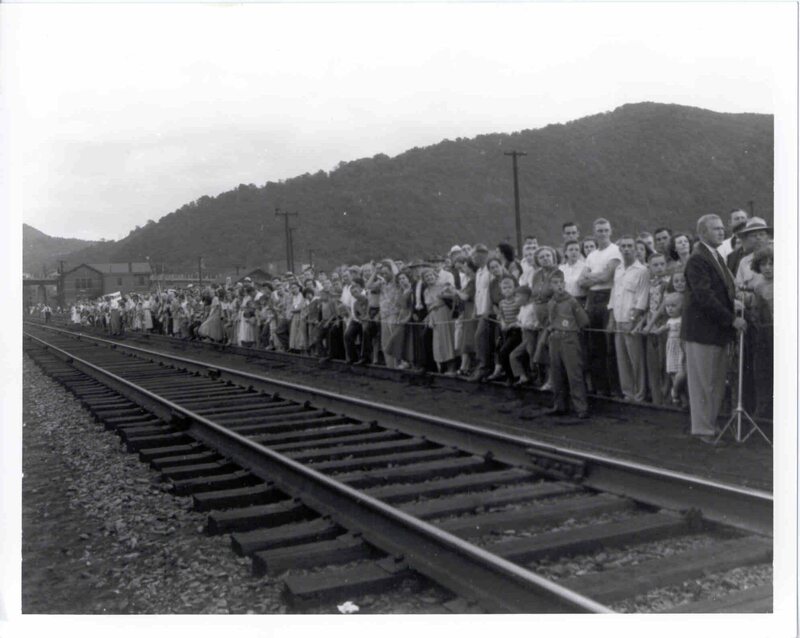 In 1845 the population in Cumberland made it possible for the first railroad tracks to finally make their way into Cumberland. From there they would depart for Ohio, Indiana, Illinois, Michigan and Wisconsin. As early as the late 1820s, investors in canal routes also had this region in mind. They in fact had initiated plans to construct canals well before the idea of laying the first railroads came to be. 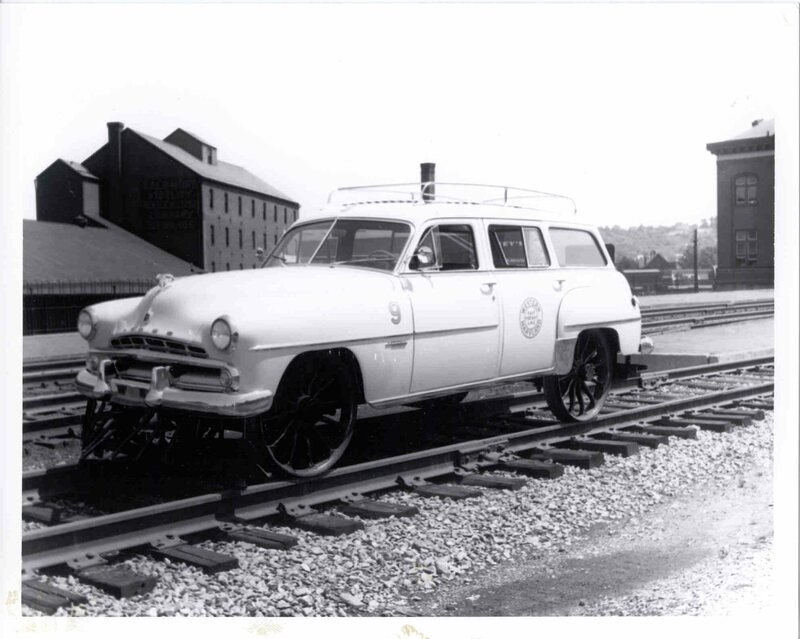 Ultimately, the canal program fell behind the railroad program planned to serve the city of Cumberland. 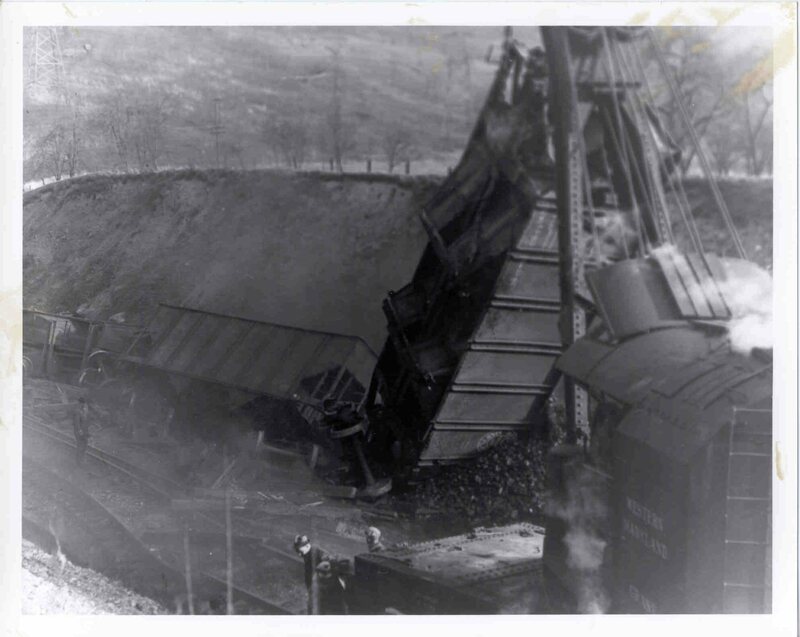 The saving grace for the canal industry was coal. 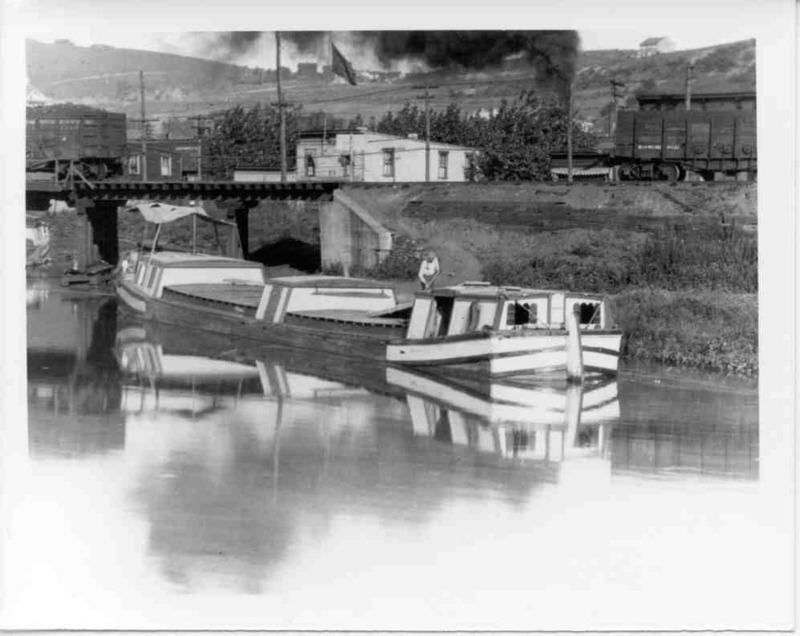 Even with a railway in place, the canal boat could be used to transport produce back east. 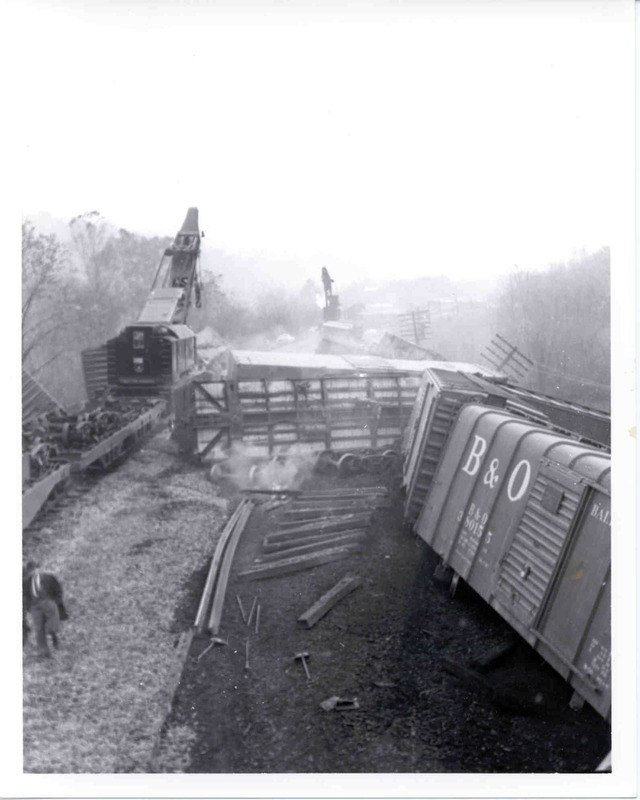 Unlike the train, the canal route had some unpredictability to it. 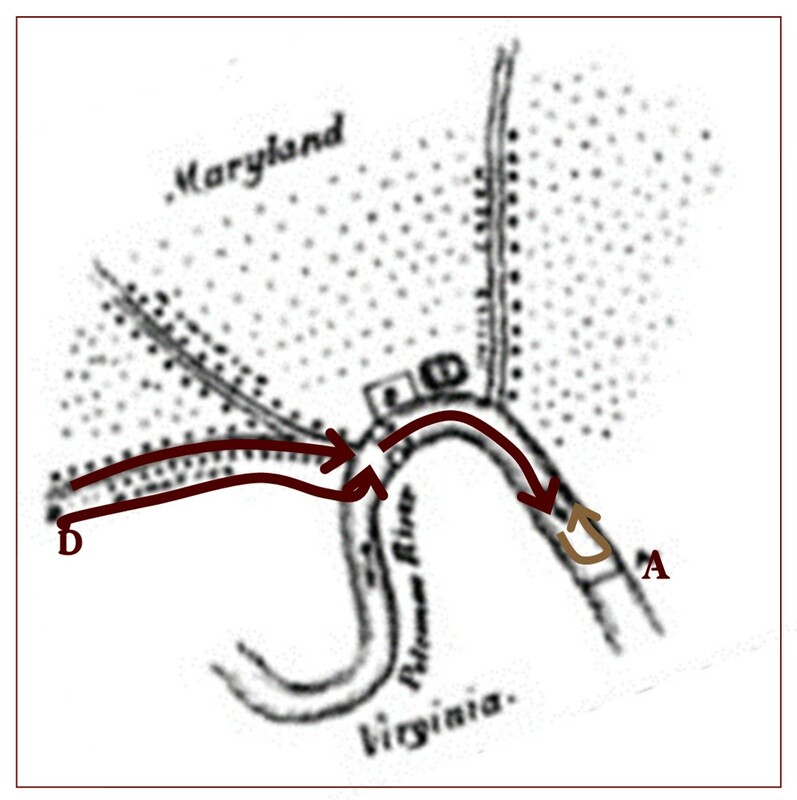 The canal used water, not rails and wood, to perform its duties, and a dam had to be built, in order to redirect some of the Potomac’s water into a side route and into the canal in a more manageable fashion. This need for an additional water route ultimately led to a slowing of the Potomac River. When the water level was high in the Potomac, it could even back up, and turn dirty and stagnant for the region. With the increasingly populated Wills Creek located just upstream, that soon made this section of the river a potential health hazard. 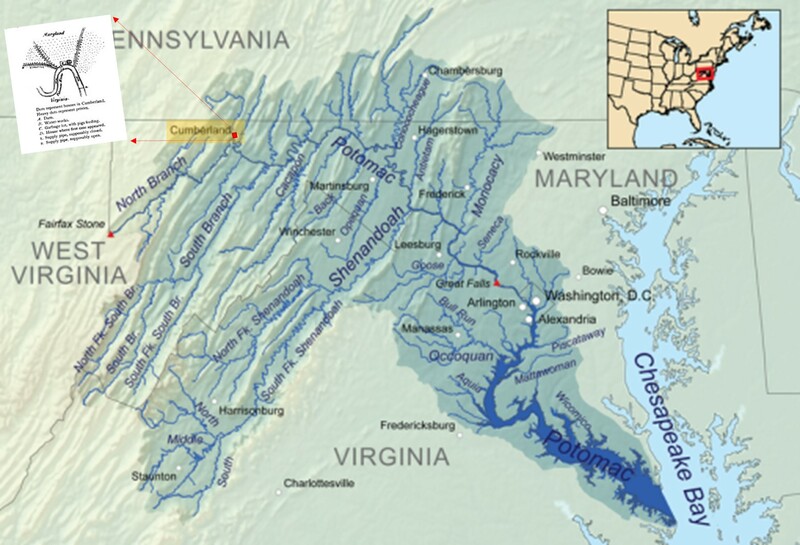 A final problem the Potomac River produced, was the effects of changing river and rain flow patterns. Flooding and high river water were periodic events, with intervening periods of drought as well. Whenever a drought period was followed by one of heavy rains, this purged the upstream area of tremendous amounts of debris and sludge. For the much smaller Willis Creek setting, where houses were being build, a flooding of human waste could easily take place, which it did. The most unhealthiest results of human settlements came down an infested the Potomac River waters, just before making their way to the edge of downtown city of Cumberland. Privy above a Railroad Track. Note the effluence that drains down the cliff face. Location: Carbon County, PA.
Latrines were everywhere during this time, but mostly along the edges of every creek and rivulet capable of emptying into the Potomac. For people living along the Potomac River, or adjacent to one of its tributaries or run off ditches, these places were where dozens to hundreds of privies were located. Most of the time, this made its such that the people upstream from the Potomac only made the lowland living conditions much worse. During a drought spell, a wise owner of a privy could cover his or her waste with dirt and treat it with lime to ward off some of the smells of disgust, or even top it with manure, trading one smell for another. But the laziest of families and small businesses simply let their privies be what they were, disgusting places to visit, but only to make brief use of on occasion, and preferably not your own privy. Finally, once the next big storm arrived, it washed everything away, to the homes of our nearest neighbors downstream. This meant that good windows that you could close completely were always a healthy investment. There were three parts of this town and its edges that deserve attention for understanding the topography of typhoid in the region. There is first that low income setting down on the river, where much of the waste generated above finally reaches the edge of the Potomac. This drainage area consists of the riverside flatland and the rivulets up above, where numerous outhouses were built according to Wiley’s map. Next there is the shoreline of Wills Creek, a very long creek that feeds amply into the Potomac, and which has perhaps the largest collection of outhouses located all along its shoreline. Finally there is the flat, level downtown region itself, adjacent to the dump and pig sty and the place where river water was pulled in for use by factories and homes in the most densely populated urban core of Cumberland. 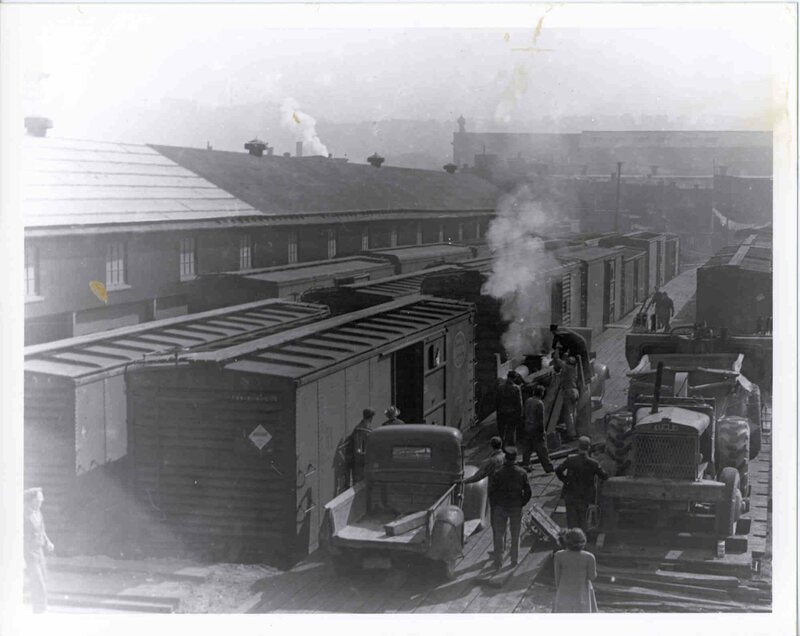 As for public health and disease beliefs and standards by this time, filthy and disgusting living conditions were the norm for some communities. But this was not enough to make changes in the local water and sanitation engineering a priority for the local government. Enterprises and economic growth were mostly on local people’s minds. Money to be spent for public health purposes was last on the itinerary for most meetings and offices. The attitude was quite different for those who lived at the bottom of the hill of these streams. But their living style often seemed to be as much to blame for their poor health as the occasional effluvium that washed onto their property from the household and businesses upstream. 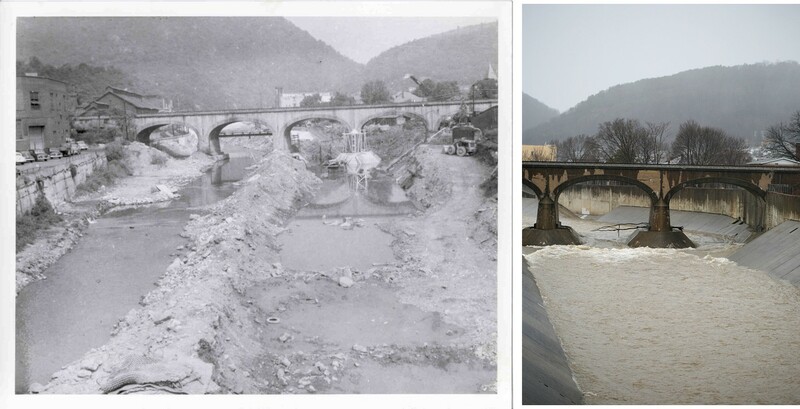 But this is little compared with the same issues along Wills Creek. The problems alongside rivulets were temporary and drainage based, those along Will Creek were permanent due to the nature of the ever present water. 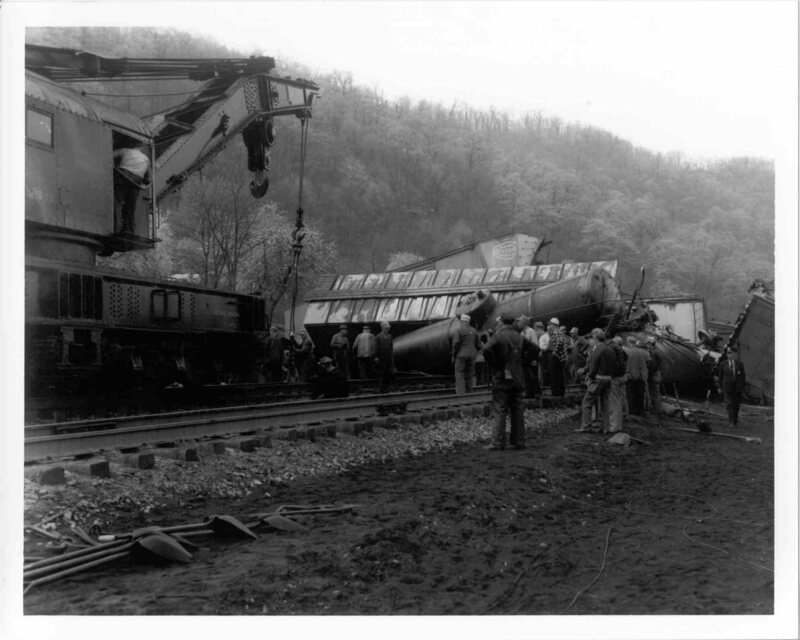 For those residing along Wills Creek, public health issues were much worse, and the likelihood for them afflicting others with their terrible diseases and waste was quite high, although few living across the Creek in the downtown area really knew this. 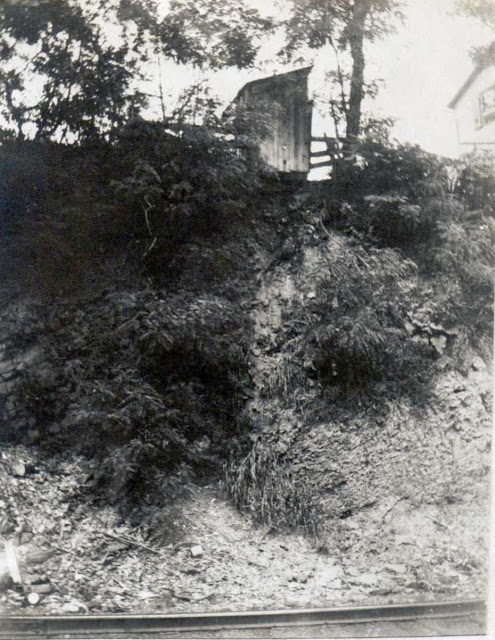 Along Wills Creek were dozens of homes with people with creekside outhouses. 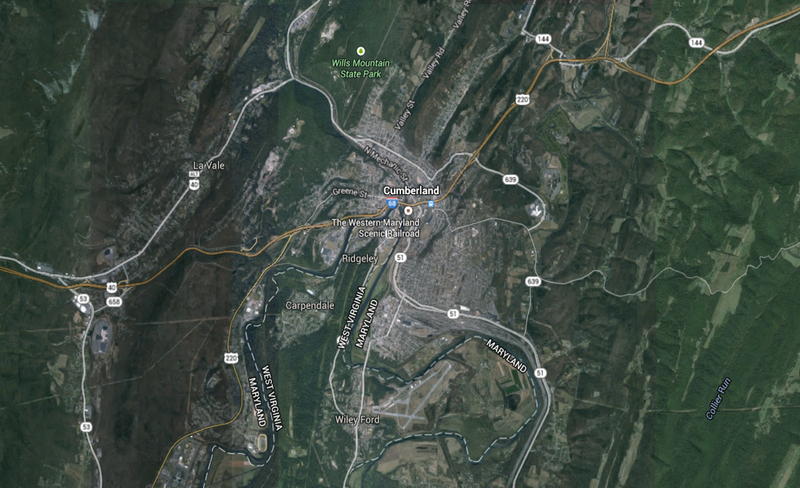 Wills Creek defined the border of the more centralized, heavily populated portion of Cumberland. Its neighbors were more upper class than those residing to the south and west. To their east were even fewer poor folks and much more rich folks, whose homes were connected to the city’s culverts, runoff trenches, sewage lines, and outhouse overspill and drainage pipes and trenches, all of which drained of course directly into the Potomac. Somehow, the city of Cumberland people had to get their water from the local terrain or rain barrels. They of course had just a few options for their local terrain sources–wells dug in open places and behind houses, directly from the creeks draining the nearby hillsides, or by way of pipes laid that led back into the city from the Potomac River. On the wayward side of the Potomac where Cumberland was built, there were the two inlet pipes feeding water into the city, and three sources for human waste and effluvium draining into the river. Inside the fork formed where the Wills Creek fed into the Potomac, there were a garbage dump and a hogs pen. These two fed runoff, debris and other forms of muck, pig’s mud and human and animal waste in the river. Recall the dam built nearby in the late 1840s. 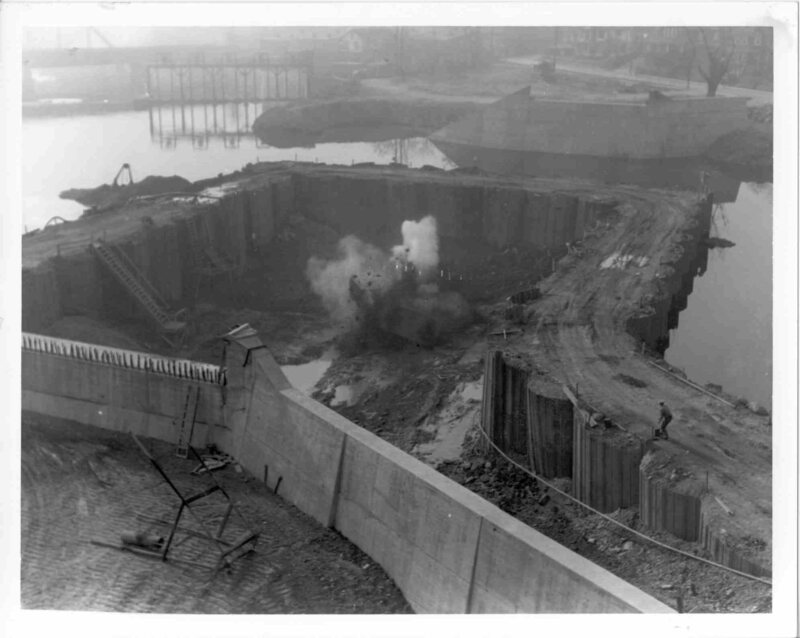 Throughout this time, this dam helped local people keep track of how much debris, sludge and garbage they were producing. Were it not for the canal, they would have never known how much effluvium they were capable of producing. Over time, as this debris, sludge and smell built up and became a popular commodity of the region, it infrequently invaded the town by way of routes travelling beneath the city’s streets, causing citizens to get ill every now and then. Were it not for the occasional heavy rains, this city would be a very unhealthy place to reside. Still, one of the disadvantages to living in this area such as Cumberland, so close to the Alleghanies, is that during each winter you become a victim of nature. Living in a narrow pass and deep valley, residing upon alluvial soil that drains quickly once it gets saturated due to its gravel beds, you are also where runoff frequently occurs due to slopes uphill, and in terms of public health concerns, you are residing not only where filth is constantly making its way into your neighborhood, you are also where nature wants to produce its naturally unhealthy miasma-rich air. In the hottest months, this infectious, viral and disease producing atmosphere is made worse by the humidity that impresses upon everyone its presence, Wherever swamps or wetlands feed the air around you with its own evaporating effluvium, fevers become possible, skin rashes mature to form cancer, influenza prevails in mid-winter, diarrhea turns into it more deadly state dysentery. Even in the winter, if you opted to remain inside your home for much of the season, you set the stages for diseases like this to happen. Highly infectious diseases like the pox, measles, or mumps can get to your home and do you or your children in. Diseases borne by rodents and other vermin in search of warmer living quarters for the winter would invade you home and introduce to you some of the newest strains of their own forms of contagion, or plague. Typhus itself was usually became a mainstay for these types of settings, brought in by rats and fleas, mostly during the cold months, it was the disease that often either made or break a community down into pieces, individual families living one way happily, or like the culture next next door due to its apparent immunity. During the first decades of Cumberland’s existence as a town becoming a city, typhus and typhoid were not easily differentiated, except by the experts familiar with their presentations. William Wyett Wiley brought some of the newest training to Cumberland when he graduated from the medical school in Maryland, and set up business in Cumberland. 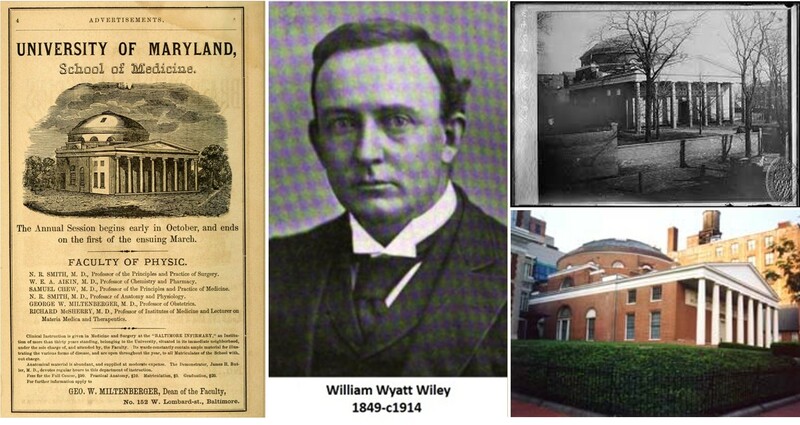 William Wyatt Wiley and his alma mater, the University of Maryland School of Medicine. Established 1807, this building became known as the Davidge Hall, named after the first Dean of the medical school John Beale Davidge. Observing all of the epidemiological happening and transitions of Cumberland, William Wyatt Wiley trained at an elite Medical School, This prepared him well for what he would later discover when he began his work in Cumberland. Wiley had quite a selection of theories to chose from for developing his explanation for a disease like typhoid. However, he favored the new theory being proposed for disease–the microbial theory, about to be called the bacterial theory for the first time. The microbial theory was popular since the late 1860s, early 1870s. It was similar to its predecessor, the animalcule theory, a concept around since the very late 18th century, but focused on smaller organisms than those typically defined as animalcules–the very small typically waterborne organisms visible to the naked eye. Microbes were viewed beneath the microscope, or an exceptionally high magnification glass lens. Like the animalcule, they were present in food, water and soil. Unlike the animalcule, they were found to be visible throughout the environment, not just potential drinking water. Also popular during this time was William Farr’s zymotic theory, defined decades before. Zymosis assigned a chemical cause for disease. It replaced the older fermentation theory once proposed for the production of disease causing agents, another late 18th century disease theory taking on new definitions and new meanings every now and then during the 19th century. The ‘zyme’ (recall the word ‘enzyme’) responsible for disease was an invisible substance, but something we felt had to exist, in order to explain the physical events taking place. We used this mental concept to explain the chemical changes we saw happening in environments where diseases were happening, and where old and new diseases were emerging and re-emerging, as endemic or epidemic causes. A large part of the behaviors that resulted from these philosophies turned many physician into “sanitation engineers” by the 1870s. The importance of sanitation was that it prevented these fermentations, chemical changes and growth of new vermin from happening. The art of cleanliness was very popular during the mid-1800s. 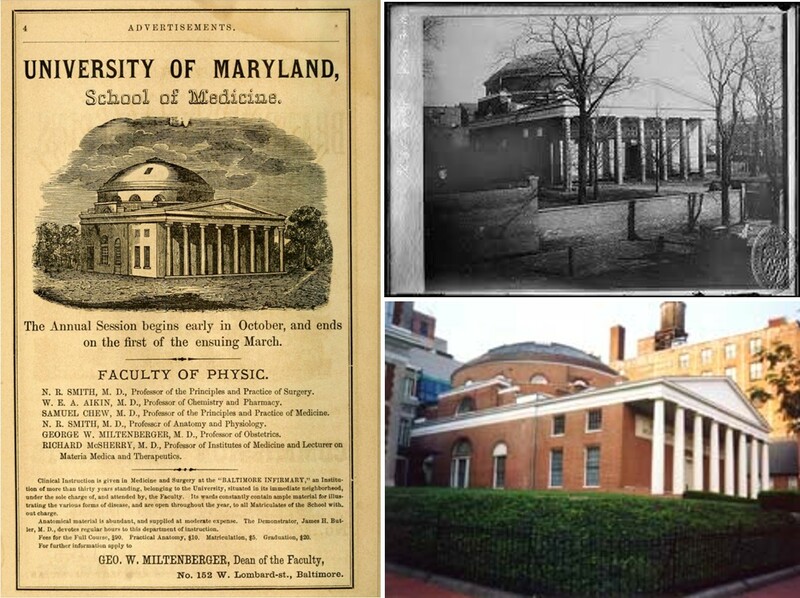 Byt the late 1800s, it not only prevailed in medicine, it was used to define the form of medicine physicians like Wiley had to learn once they were enrolled in a place like the Maryland Medical School. When Wiley headed west, he brought with him his knowledge about topographic and sanitative medicine, the contagion and miasma philosophies for disease, Farr’s zymotic disease theory, and his own philosophy about “filth” and how preventing unsanitary living practices could be the way to prevent epidemics from returning. In Cumberland, we had an unfortunate combination of health and living practices to deal with. There were more settled, stable, crowded, and at time very healthy living conditions, when compared with the coastal states. A common philosophy for the time was that mountain air was cleaner, and much healthier. But like Benjamin Rush had proposed decades before, living in the wilderness had its own set of diseases to contend with. The primitive, barbaric conditions of a backwoods village or town like Cumberland could truly test the skills of a physician who was trained back east. Knowing the diseases in one region did not necessarily mean that you knew the diseases in another. Cumberland’s typhoid fever problem was due to human behaviors and poor sanitation, any climate or topographic based theories that came to a physician’s mind, were simple distractions to discovering the true cause for a disease like typhoid. Although a fever, it would behave very differently from many of the other fevers doctors grew up learning about, in the wilderness or in the school setting. So what was the geographic process that Wiley had to see with the typhoid when it struck Cumberland in the winter of 1888 to 1889? Setting the stage for this were the weather and the privies. In the privies uphill from the Potomac there were these microorganism that nobody knew about, animalcules that infected the water and made it unhealthy for human consumption. In just a few months, the spells of droughts followed by heavy rains enabled a build up of human waste to occur beneath the privies, something which a little lime every now and then could treat. But the floods would occasionally wash this debris away and into the creeks beds directed into Potomac River. It was these events that ultimately turned the water behind the Potomac River dam into an potable liqueur containing sediment, sludge and numerous bacteria bred by humans. During during the winter of 1889, this water finally became pathogenic, and as it made its way back under the city by way of aqueducts meant to replenish the city of its water supplies, many people became ill and ultimately, a number of them died in the weeks and months to come. A local physician’s review of this epidemic might lead him to conclude that weather, miasma and effluvium was the cause. But a more recently trained doctor would immediately suspect people as well, and poor sanitation. With the “microbial theory”, using that name, in the literature since the 1870s, this facilitated the introduction of the notion of the “bacterial” theory for disease, the philosophy that Wiley and his supporters used in 1890. By creating his simple map, Wiley proved to himself and others that this was the case. Wiley used this map to blame the disease on the inability of the town to keep up with the growth of the population in this city, and the problem that erupted with the drinking water due to this lack of upkeep with change. When we look at the remains of Cumberland today, we can still see evidence for what it was like back at the end of the nineteenth century, and the role public health had to play to prevent this epidemic from recurring. As more and more shacks and homes were built along the rivulets flowing from above, and along Will’s Creek, the drainage ditches constructed to deal with this rainwater guided the privies waste into the Potomac River. If some of it was allowed to settle into the soil along these rivulets and creeks, any back yard wells dug there, just feet from the stream, would become contaminated as well. The more in the outskirts of the city a place was, the less sanitary its setting was, with some of the worst shanties built near local drinking establishments built to serve the local coal miner communities. More graphically stated, once the rain fell, cowpie-like remains of human waste lying in the privies turned to sludge (no nicer way to put it! ), and then flowed into the ravine a few inches away. From there it flowed past numerous homes, outhouses and shanties downstream. With each passage, this sludge was enriched by the neighbors’ supplies. Along some of channels, these rivulets passed by a school or church. Most passed under the main roads that led into and out of Cumberland, including the famous Cumberland Turnpike. One of the very first sources for this was a local bar at the top of the hill, where miners’ needs were attended to. These events weren’t the only one leading Cumberland residents to experience a typhoid epidemic. As this sludge turned into a slurry, by the time it reached the bottom of the hill, it became a richly colored seepage flowing outward onto the flats of Walnut Grove, cutting through the alluvial fan laid out here, where it rested until it could slowly creep into the river over the days and weeks ahead. When the weather was just right, this turned the waters of the Potomac into a very unhealthy site–an understatement perhaps. The effluvium erupting from this place made its way into homes through back doors, kitchen and bedroom windows, passing from one household to the next in weeks ahead. All of this very good evidence for the effluvial-miasma cause for disease. Continuing with this logic, once this effluvium and sediment flowed into the Potamac, a new set of rules and behaviors ensued. When it came upon the dam, the water slowed and sediment was formed on the river bottom. This water became turbulent in some places, re-suspending the silt at times thereby releasing whatever causes for disease still lie there. The flow of disease back upstream was now possible. If it didn’t spilled over the water falls, it found a new route into the canal or back into the city by way of the drainage systems beneath the homes and streets. Whatever path was taken, this led as well to the revivification of the effluvium, enabling it to infect the cleaner parts of the city. A health risk once a risk mostly to shanties, became a problem that much cleaner, upper class communities had to face. 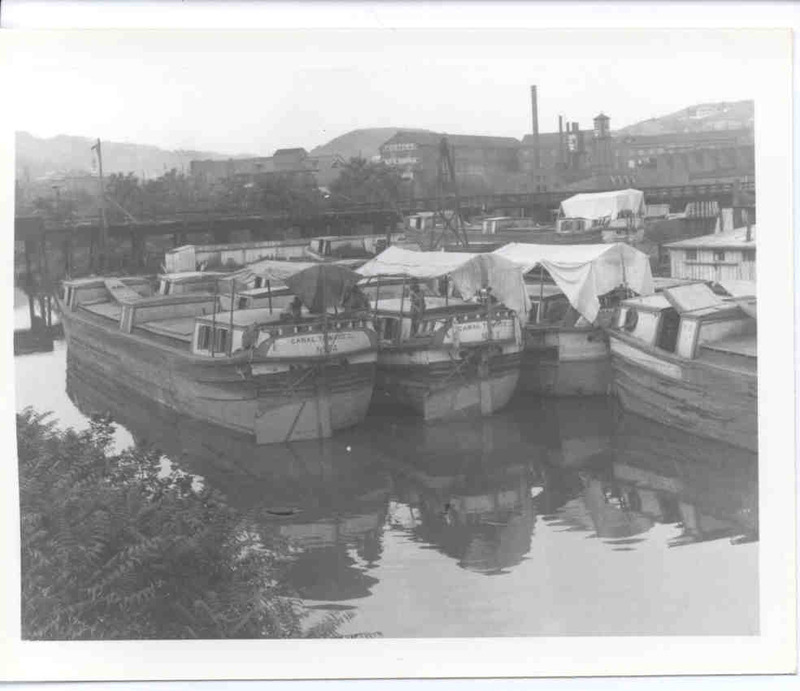 At the junction of Wills Creek and the Potomac there was land used for garbage disposal. Right next to it was a fenced area, where hogs roamed about. This facilitated the frequent consumption of garbage remains by hogs, being bred for food. The contamination of their flesh and skin by these viruses, toxins, what have you, made for a even more unhealthier part of the city to be developed. In addition there was the waste of a hog pens and the seepage of garbage coming together into the river, along with the same soil creep, erosion of topsoil, and occasional rain- and farmer-generated slurries adding to this waste in the river. Wiley’s map is to the right; a current Google Map image of the region is to the left. Just how much of the detail someone’s sludge, slurry, soup, sediment, soil creep Wiley was familiar with is uncertain. But his theory for the cause of the typhoid epidemic that he ultimately developed was right. He eliminated the use of the much older topographic and climate theories for disease once popular, along with any primitive versions that existed as well related to miasma, effluvium and zymosis. Wiley blamed this disease on “filth” and unsanitary living practices. Nothing more needed to be said, just proven to local sanitation officers and water police. The study of the chemistry and microbiology of water had been in place in science now since the late 1850s, when it was relied upon in London to monitor the Thames River. Water policing included documenting the contents of this water on a regular basis, not just making sure the pipes leading in and out of a region were working. By the late 1860s, this profession of monitoring the water for its suspended sediment was given its own unique name–“the Inspection of Privies”. We can tell by Wiley’s writings that he was familiar with their practice and based a lot of his own analysis on a similar philosophy. He was not as much an inspector of privies, as he was a critic of the slow changes in the local public health movement underway. The lack of evidence for Wiley being correct is understandable. In the winter, there was no visual proof for what Wiley had claimed, such as the discoloration of or increase in stench produced by the river water. There was also the lack of mid-winter proof of contagion developing in that water, something like algae brought about by this human and hog waste serving as fertilizer. So it was Wiley’s words and ways of conceptualizing how this disease existed that would have been needed to prove his point–the map proved his claim to many. Once the warm seasons were back, Wiley’s theory could be shown to be true, and so like John Snow blocking off the well in London back during the cholera epidemic of 1849, Wiley went over to the in-flow pipe on the other side of the Potomac to see for himself how and why typhoid came to Cumberland. When he finally sent his map to the local authorities, trying to prove his point with the locals seemed impossible. As for the doctors and scholars back east, Wiley’s theory was more than just a success, it was proof for everything being said about the microbial cause for disease made sense. In spite of his proof provided for this theory for the disease in Cumberland, Wiley and his east coast writer and follower Eberth, weren’t immediately accepted by all physicians. 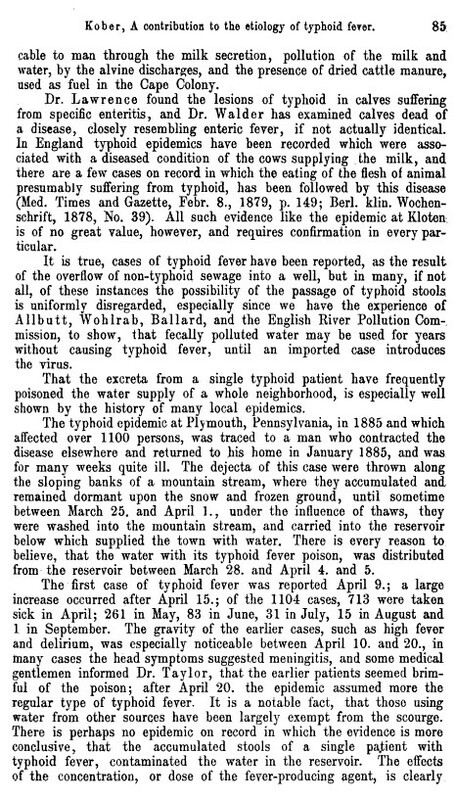 It wasn’t until the 1890s that this theory became a part of the famed pillar of knowledge of “modern medicine.” The Cumberland typhoid fever epidemic represents a turning point in disease theory, and demonstrates a change in the value of the use of a map to better understand disease patterns. No matter how lengthy our theories for disease are, with explanations related to the oceans, rivers, weather, latitude lines, mountains, swamps, and and animal behaviors, it was the filth developed by people are that remained the primary cause for disease, today as in back then. Immediately reacting to Wiley’s important findings back east was journalist, correspondent, and epidemiologist Dr. George Martin Kober of Washington DC. Communications between Wiley and George Martin Kober, led to an introduction of Wiley’s map to Kober. This formed the proof needed for both of them to develop a strong support for the microbial or bacterium theory of certain diseases. This event in medical history and disease mapping is an unmentioned and highly part of historical medical geography history due to its relationship to important concepts in today’s review of the same medical geography and environmental health. Currently, the Potomac River has many issues that relate to environmental health, drinking water, land use policies, the health of the heavily populated Washington, D.C. area. Filth in the Potomac River has the same impact today as it did back then. 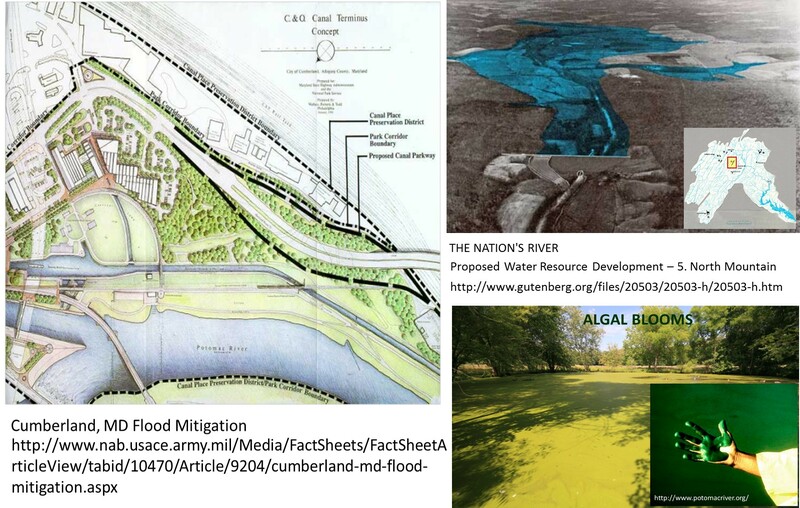 A dam similar to the one responsible for this public health dilemma still stands today, the canal still is used, and the greenish of sludgy forms of water and soup still manifest every year once the stillwater sections of the Potomac are heated up. Maps of these parts of the city today, illustrating where the houses stand, superimposed with aerial photos, also detail for us the placement of lower income establishments relative to nitrogen-rich, stench producing alluvial settings. There are still buildings and people residing and/or working at this part of the Potomac River edge. Similarly, the water ditches responsible for typhoid in Cumberland still exist. Some have been renewed, others remain in their traditional form, atop which a new road was laid. Because of the success of mapping diseases at the small area level, instead of global epidemic centered “regionalists’ approach” , disease mappers were slowly transitioning their skills into something more directly related to this new medical science. There remained a few like disease pedologist (a soil specialist) Max von Pettenkoffer who had a reputation to uphold and so were much slower in accepting these changes. 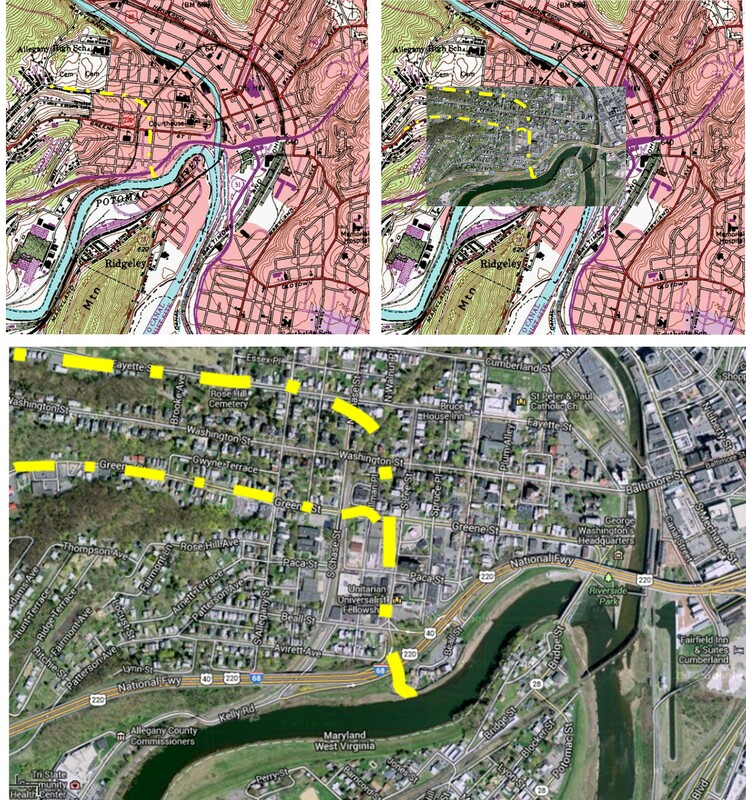 The mapping of typhoid fever in order to better understand how it behaved spatially was a task that most disease mappers were fully engaged in by now. 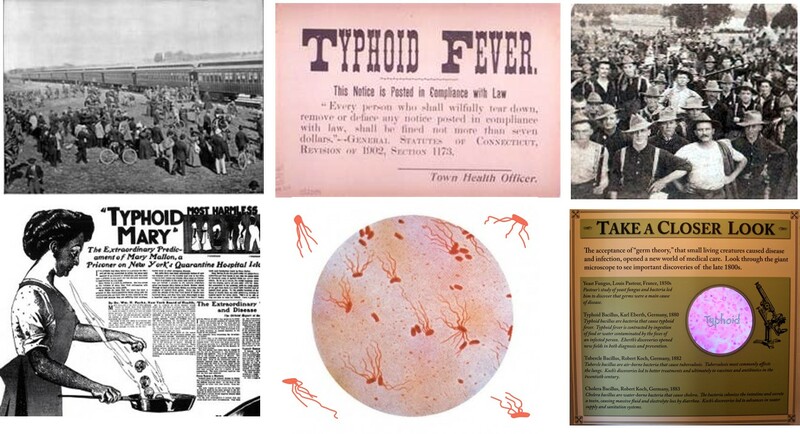 Typhoid had been fully differentiated from other similar fever inducing diseases with different causes like typhus and some of the tick fevers. 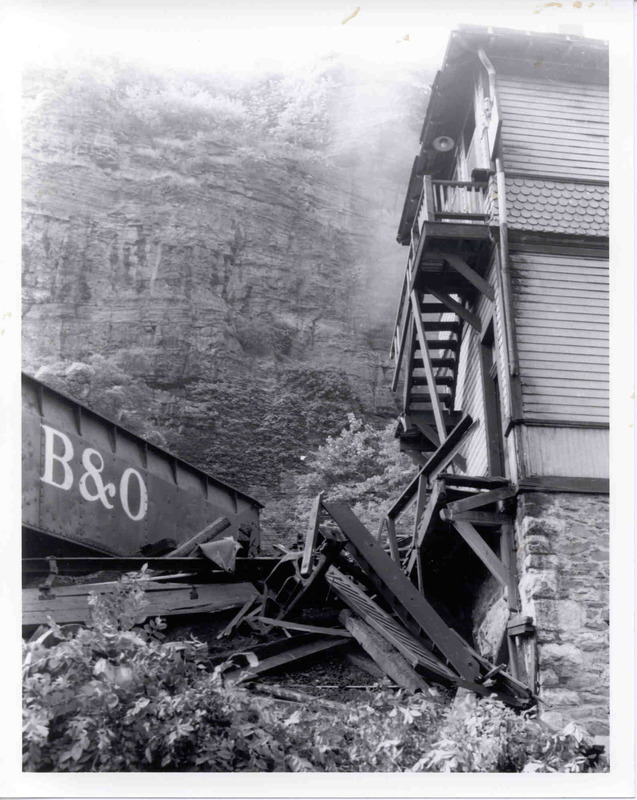 In Cumberland, Maryland, a place out in the wilderness were it not for the numerous forms of public transportation system at hand that relied upon it, became a prime sport for typhoid to erupt and to make it possible for epidemiologists to demonstrate how it supported the new microbial theory in 1889. Drs. 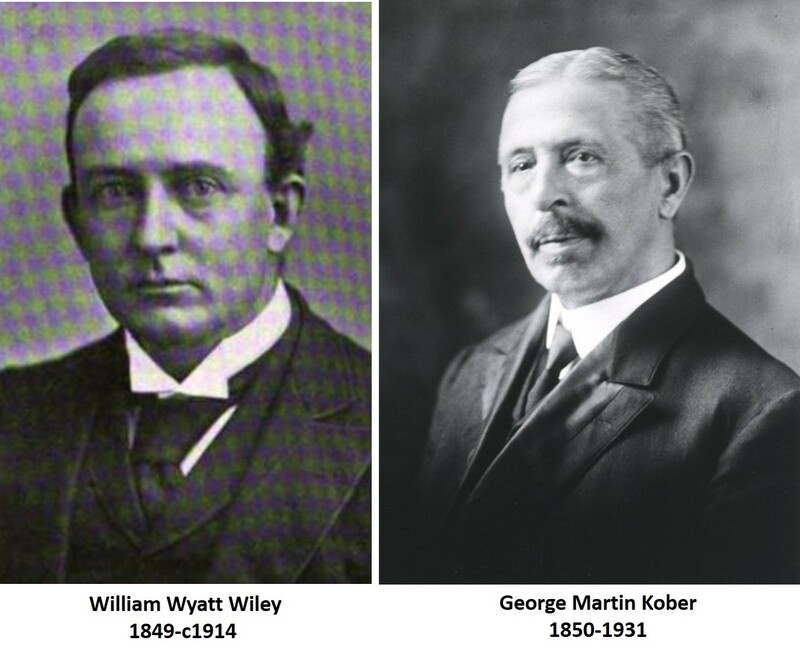 William Wyatt Wiley and George Martin Kober were to the two to engage in this opportunity. Due to the rapid development of the former village setting resting close to the river from 1860 to 1880, sanitation practices and evaluations was never fully engaged in as part of the development process. One invention of a new local land or water use change after another was engaged in without much thought as to the long term impacts of these on local health. 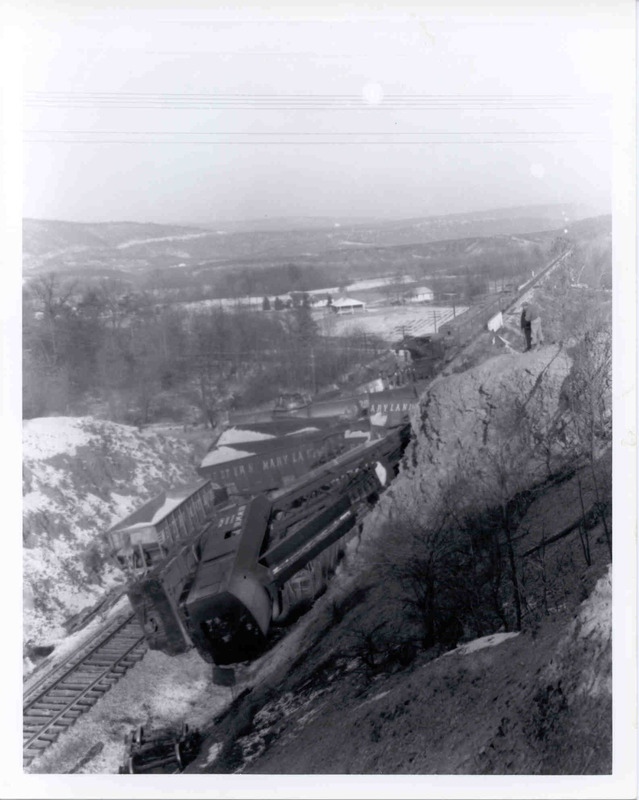 Much of this change began due to the extension of tracks owned by the Pennsylvania Railroad company into the town of Cumberland. 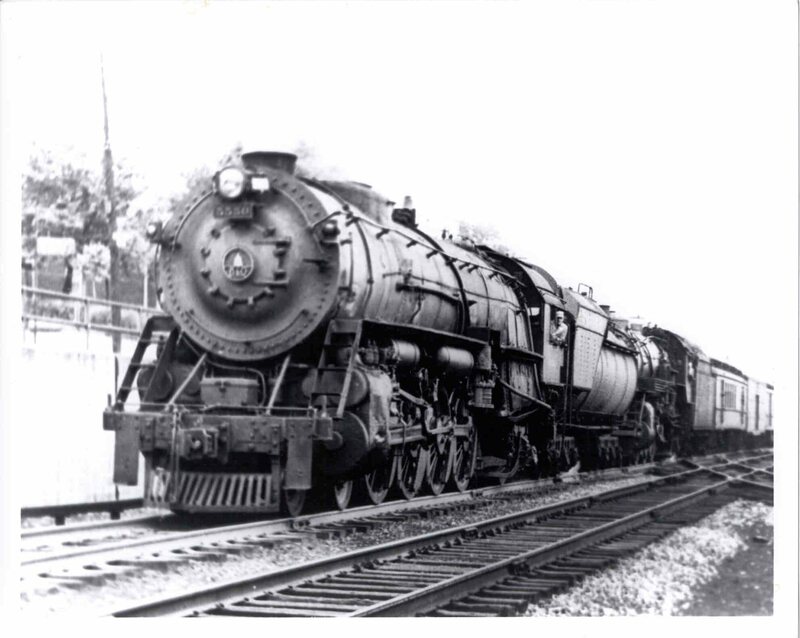 This railroad changed Cumberland into a major hub, connecting the Midwestern states with those of the east coast. By 1880, populations were so crowded, that the highly porous alluvial beds they were living upon became a health hazard waiting to happen. Wateredges in some places riddled with rotting marshplants and aquatic life. Next door there were places where hogs were kept which were in direct access to the river edge, close to the downtown city. 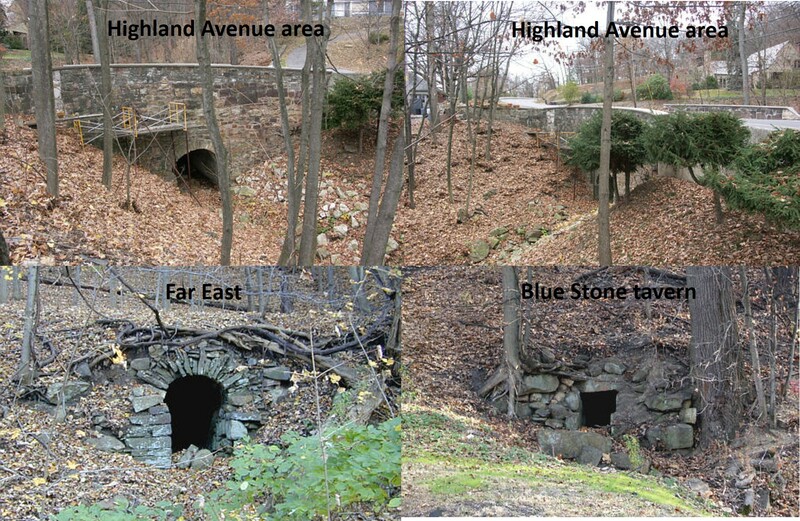 Upstream, along the small creekbeds that ran off the hillsides and into the Potomac and the big tributary of the Potomac known as Wills Creek, there were rows of privies established all along the shorelines, emptying directly into the creek or just uphill from it awaiting for new rains to wash it clean. This meant that on a very rainy day, excrement, and other forms of foul waste and debris from people and domestic animals made its way down to the Potomac, and from there to the core of the downtown city area, with its canal and large dam. This absence of disease during the early years of settlement in this region had much to do with its population size, and the lack of interest in this part of the country. Once German settlers took interest in a region along similar latitudes to the north of Cumberland, in the State of Pennsylvania, a greater impact of east coast economy on this region could be seen beginning in the 1830s. 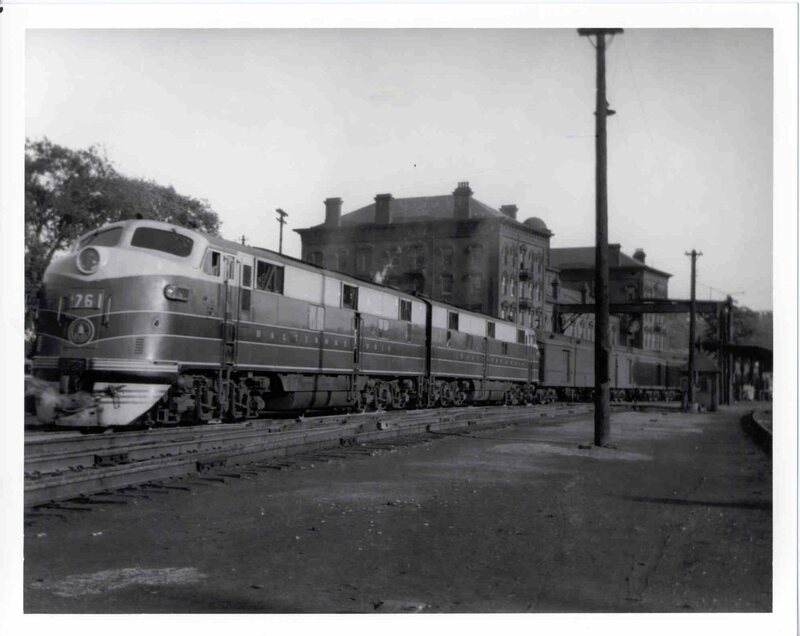 This in turn increased travel through this region, and soon Cumberland became a railroad town when the Baltimore & Ohio Railroad company extended its rails to Cumberland in 1842. 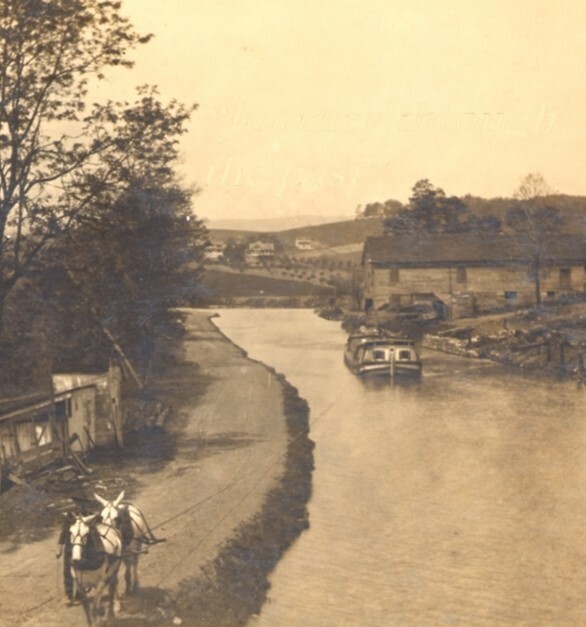 In 1850, a canal was built by the Chesapeake and Ohio Canal Company, along with a dam to redirect the river’s water. Construction of the first factories would soon follow. 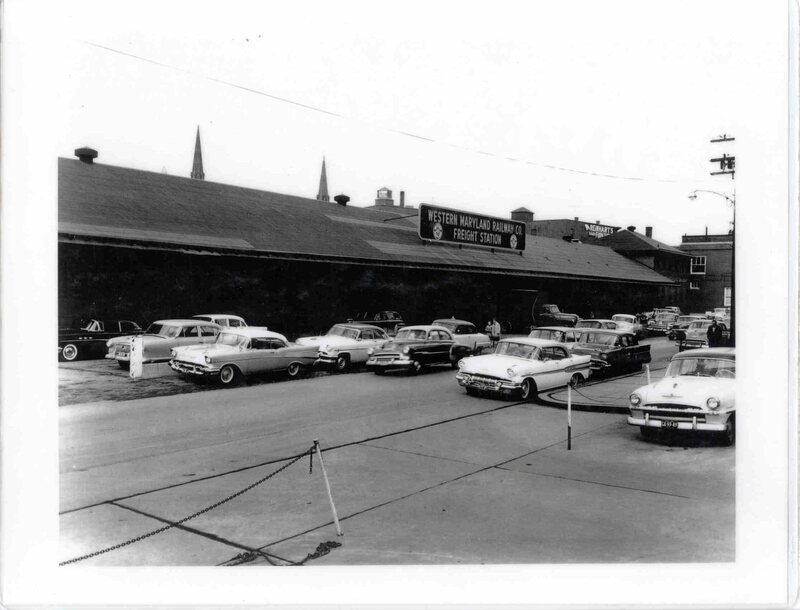 The sanitary sciences came to be during the decades that Cumberland grew. But little of the teachings of sanitary scientists impacted the lifestyles of this community. As the city continued to grow, housing facilities became crowded along the flood banks of the Potomac River. This rapid growth of a town set the stage for new health problems to develop. The typical health problems for the region in the beginning related mostly to the seasons, lifestyles and occupations, but as the local population increased, opportunities for disease migration into this area came about and in 1853, due to a flood year, cholera was able to strike the town. The growth of Cumberland into a major city setting between 1865 and 1880 set the stage for the typhoid epidemic that struck this city in 1889. The development of densely populated living settings, in turn led to the start of some urban related disease patterns (Sequent Occupancy Stage 3 in theory). Whereas during prior pre-industrial years we would have expects many of the standard diseases of early habitation, such as measles, mumps, the pox, diphtheria, and scarlet fever, with the development of industries and the dense packing of dwelling came sanitation related issues, namely the diseases often associated with contaminated water such as Asiatic cholera and typhoid fever. 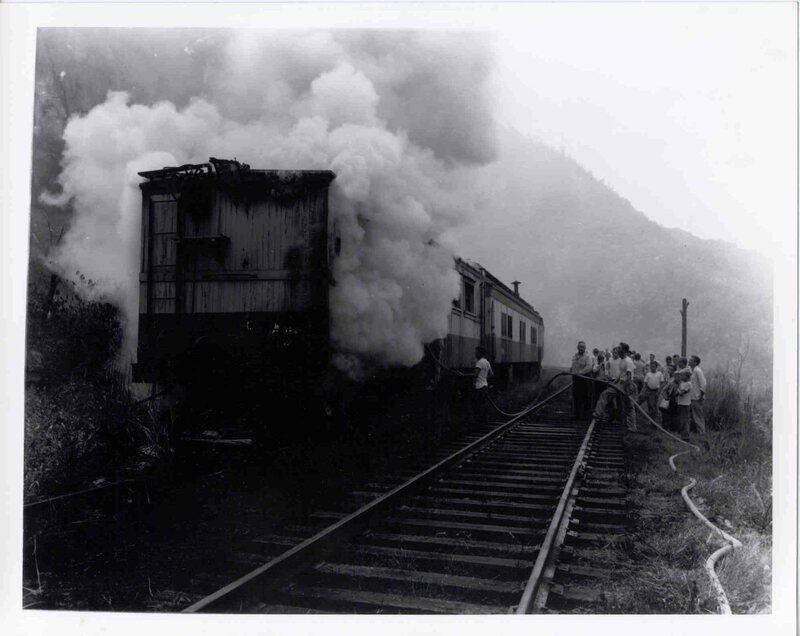 Dr. Wiley made quite a statement about these unsanitary conditions, which conveniently set the stage for him to document how a natural disaster could develop due to this under-monitored, rural, railway town lifestyle. 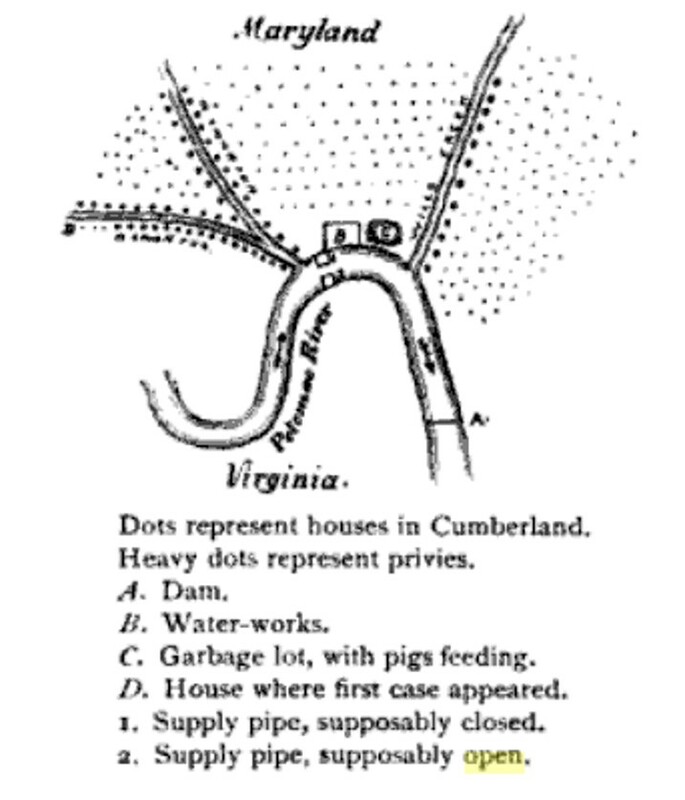 In the 1890 edition of Wiley presented his article about the epidemic in Cumberland, providing them with the following very rough, hand-drawn sketch of the region to make his point. According to Wiley’s written text, the supply pipes provide water to certain households (interpretation used here is the supply pipe closest to Water Works B) is identified as ‘1’ and the other as ‘2’. 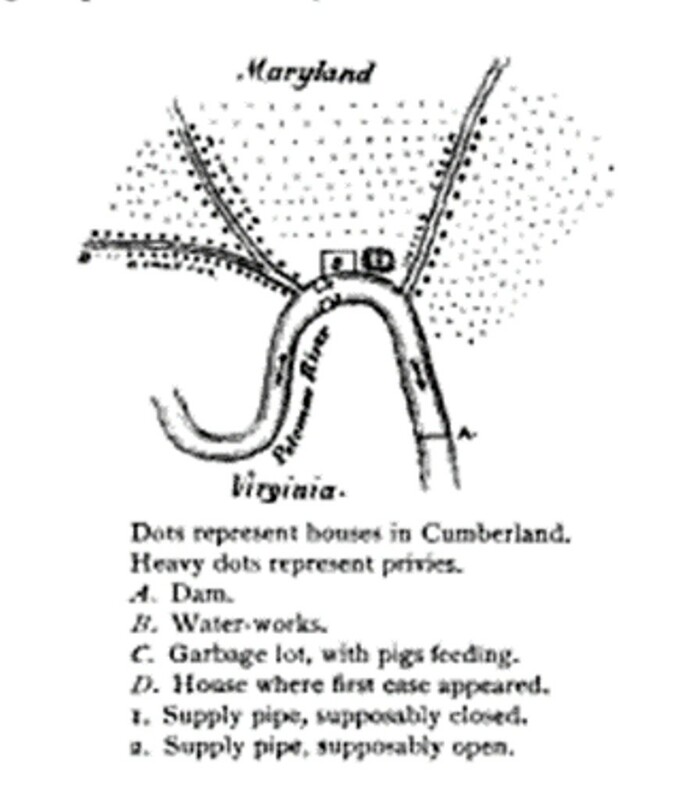 In the text of his article, the pipe on the sewage side (pipe 1) is prportedly be closed and the pipe on the Virginia side (2) open. 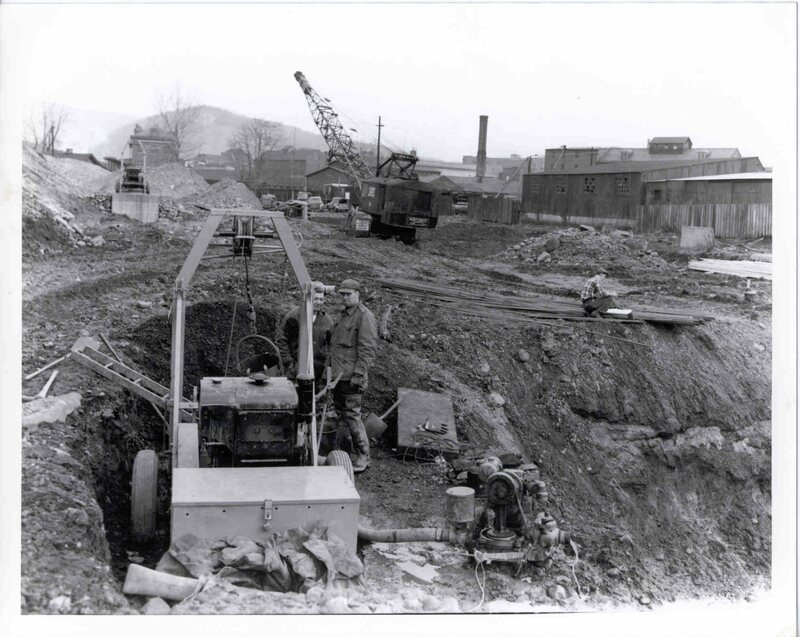 But according to his review of these facilities following the epidemic, Wiley found the pipe on the city side, Pipe 1, was reopened due to the damage of Pipe 2 by excessive waterflow and mud weighing down upon its structure. 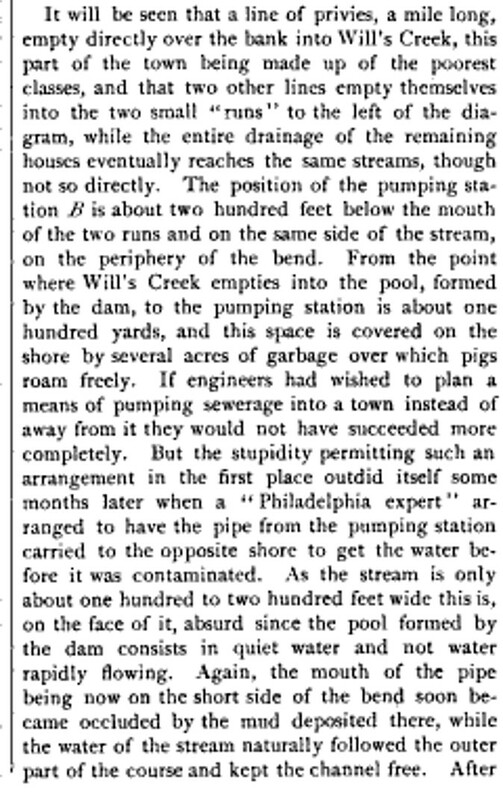 Wiley claims that once Pipe 1 was reopened, this allowed the city water supply to be contaminated by water sucked up from the river on the side where Hogs roam the garbage site and where the city’s sewage is treated and then released into the Potomac River by the Water-Works facility. In theory, a disease that occurs or develops anywhere on a watershed has the potential of impacting the major consumers of that water downstream. In actuality, it is hard to change the water chemistry enough impact the people down below when it comes to health, except perhaps for those residing in the immediate vicinity. A century before, the influences of events upon city water supplies were more formidable as public health concerns, due to the limited water supplies these setting had. 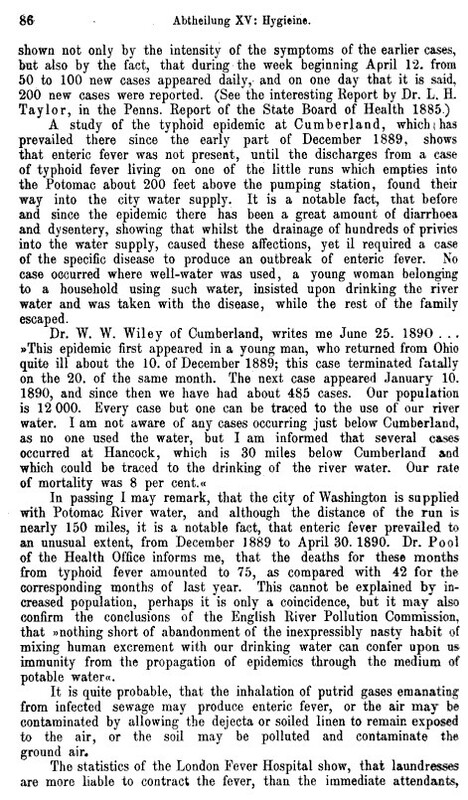 The Cumberland, MD, typhoid epidemic of 1889 demonstrates this impact quite well. In 1833, in his History and Geography of the Mississippi Valley, Timothy Flint wrote about the tendency for higher elevation regions to be healthy in Maryland, but the lower portions and warmer parts of the state to be prone to producing too much miasma. Very little is published on the disease patterns of this part of the country for most of the antebellum medical history period. In 1854, a cholera article was published in The American Journal of the Medical Sciences (C. H. Ohr. 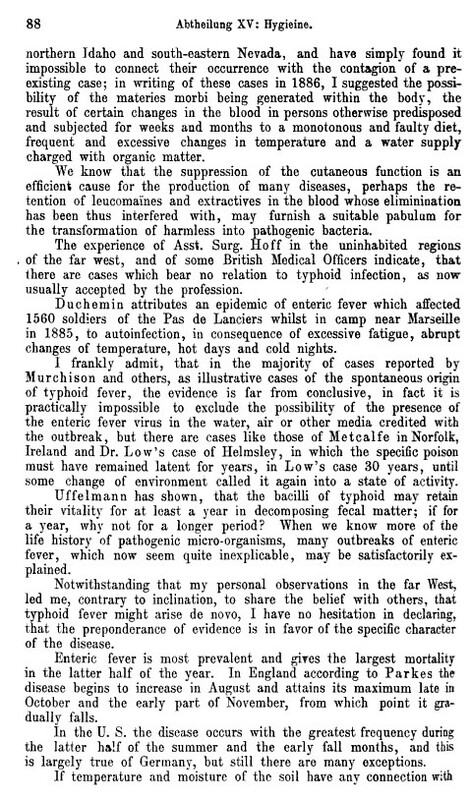 Epidemic Contagion; its contagion pathology and cure; with an Account of the Disease as it Prevailed in Cumberland, Md, Volume 27, Jan 1854, p. 102-112), but this article was not a review of the geography of this disease. As Flint notes, the state of Maryland has its southern and northern climate types, with the disease patterns for each differing much due to their varying climate differences. 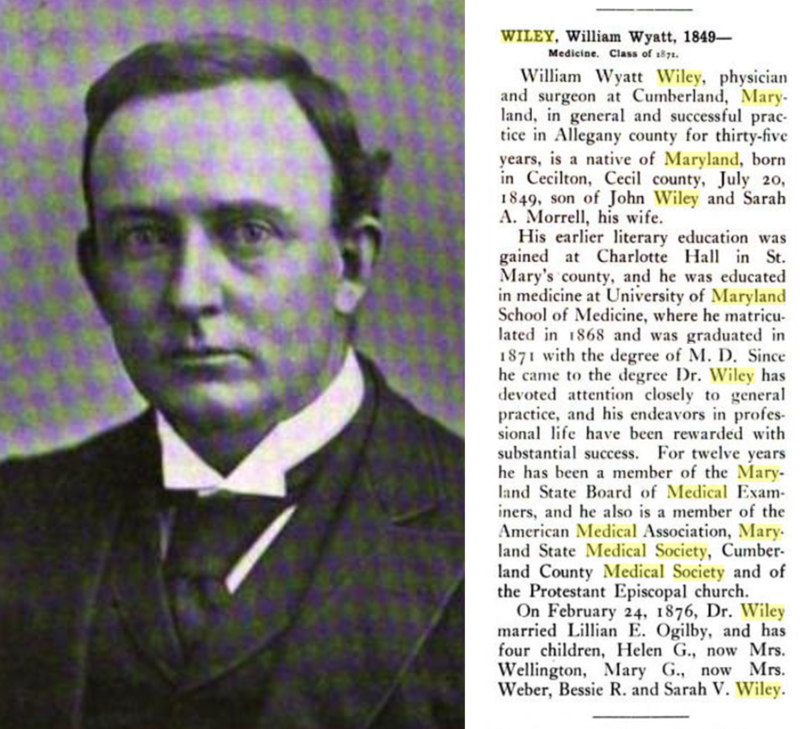 William Wyatt Wiley graduated from the University of Maryland school of medicine in 1871. 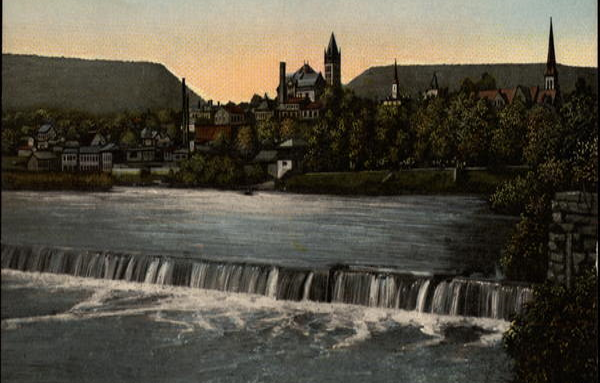 By the late 1880s, he was practicing in Cumberland, Maryland, and was there to witness the events that led up to the development of a typhoid epidemic in the city in 1889. A year later he would share his experience with George Martin Kober, a physician who spent some time employed by Harvard and later Georgetown University. To demonstrate how much much was changing now that the bacterial theory for disease was developing, a century earlier (1790), this disease was considered one of the many febrile conditions known to strike. By 1825, the fever associated with typhoid was pretty much considered identical to the very different febrile condition typhus. By 1850, typhus and typhoid were now differentiated from each other, with some specifics about each now better defined, resulting even in some sub-groupings for each classified. Typhus for the most part was behaving seasonally and appeared to be related to the shipping industry at times. Typhoid, once it could be differentiated from typhus, was more a local disease problem that erupted in well defined population settings. Climate and local water bodies such as marshes and swamps weren’t always required for typhoid to develop. Rather, it was human living habits and personal behaviors related to personal and professional sanitation practices that seemed to be more closely link to the much newer, non-traditional typhoid disease pattern. All of these issues with identifying the source and the cause would change in the 1880s as the bacterial theory was better understood. The bacterial theory for disease was now becoming popular and the knowledge of how to identify a disease as being of this origin was becoming better defined. Wiley managed to define the cause for this epidemic based on the observations he made concerning its relationship with the various unhealthy settings–namely the latrine sites and a site where garbage was disposed of, which hogs were often allowed to frequent. In the maps that follow, the left figure is a recent map of this region, reviewed to get a better idea on the quality, resolution and accuracy of the map produced by Wiley, and how to best interpret and visualize the point data he provides on his map. On Wiley’s map to the right, lighter points pretty much indicate household settings. The central area has these points placed in a hexagonal array. Areas to the left and right of this section also have hexagonal placement, but are slightly more irregular. 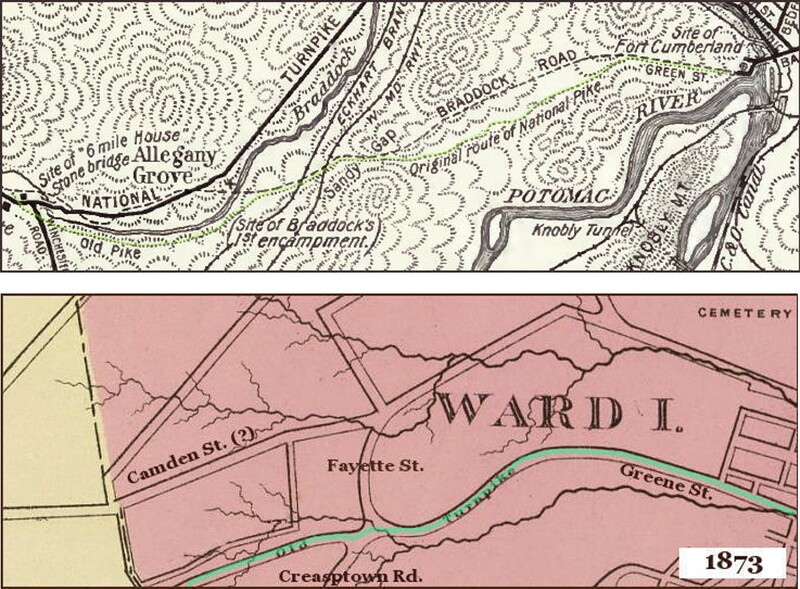 On the map above is a small rivulet or creek added that bifurcates west of the Potomac and west of Narrows Park. 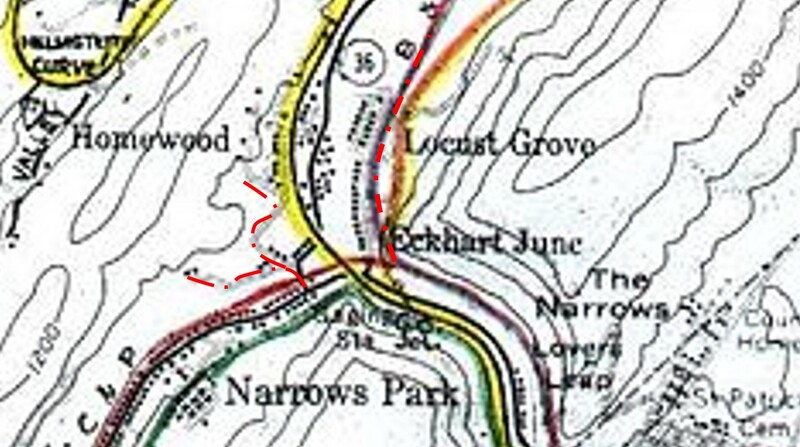 No such tributary is actually noted on this map; the red line was drawn under the assumption that the creeks pretty much parallel the roadway that was settled upon. Like the Will’s Creek shoreline, these routes are also a fair representation of where the latrines are noted on Wiley’s map, further supporting this claim. By no means was Wiley’s map akin to many of the professional reports generated weekly or monthly, some of which are produced elsewhere at this site. What’s important to to note there is that it sufficed in making its point regarding public health, and was used by another writer, George Martin Kober, a physician working in Washington DC, to make an important point the following year. 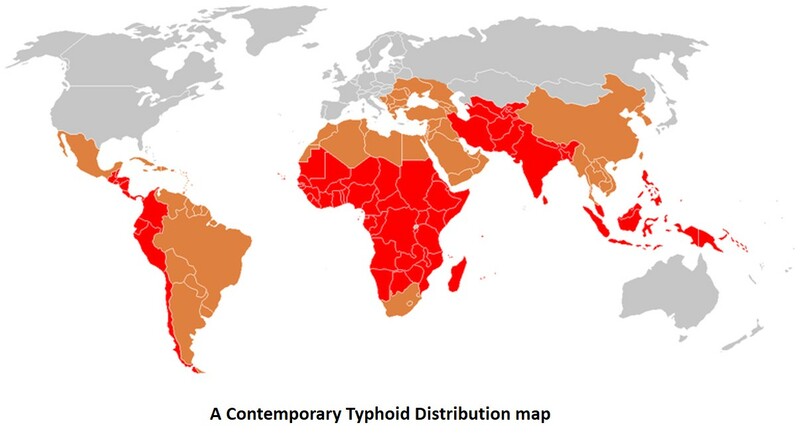 The main flow of typhoid in the water could be predicted using these maps, and their source determined assuming the bacterial theory for disease is true for this epidemic disease causality. According to Wiley and Kober, typhoid epidemic started with the single case at point D, which in turn contaminated the river via a latrine at the edge of the creek. This place of origin was also situated at the edge of the urban setting, and came from a low income community setting where no indoor bathroom facilities existed and where potable water at times was scarce. As a result of such living conditions, the neighbors could also be afflicted,in turn contaminating the creek water more. As this water made its way down to Potomac, and then continued on down to the dammed portion of the river, it essentially stagnated, enabling anyone in this part of the city at the time to become exposed to the disease residing in the water. Assisting this process along from May 30th to June 1st 1889 was a flood that struck Cumberland, coming in by way of Will’s Creek. This resulted in a rise of water levels along Will’s Creek of 29.2 feet, well above the flood plain for that part of the city and enough to impact at least 5 square miles of city streets. This would have also washed out any remaining holdings of the streamside privies, thereby sending large amounts of sewage-infected runoff waters into the dammed up water down below in the heart of the downtown city. As a result, dirt, decayed plants outwash, grime and infected waste, silt and sediment coated the streets, benches, posts, park grown tree trunks, railings, boardwalks, and the like, all in popular public gathering places. But even more importantly, this stagnation enabled contamination to take one or two routes back into the remaining uninfected communities. 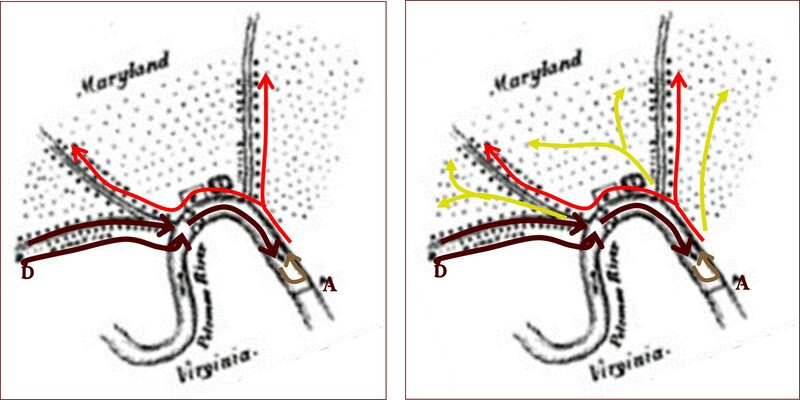 Backwash (brown arrow) may brought the disease back upstream along the main Potomac river (red arrows) during the stiller times of the years. However, its presence in the water also made it more likely to infect people, and for these newly exposed cases to bring the disease back the their home community settings (yellow arrows), now infecting the groundwater from their home built water closets and outdoor, backward latrine settings which empty directly into the earth. Adding to the credibility of these findings and the implied theory for this diffusion process were Max von Pettenkoffer’s (portrait above) ideas on disease theory then circulating about the various subgroups comprising the medical geography profession. Pettenkoffer visualized the soil as what me might call a large sponge, with dirt, sand and gravel components providing spaces for air and water to flow through. 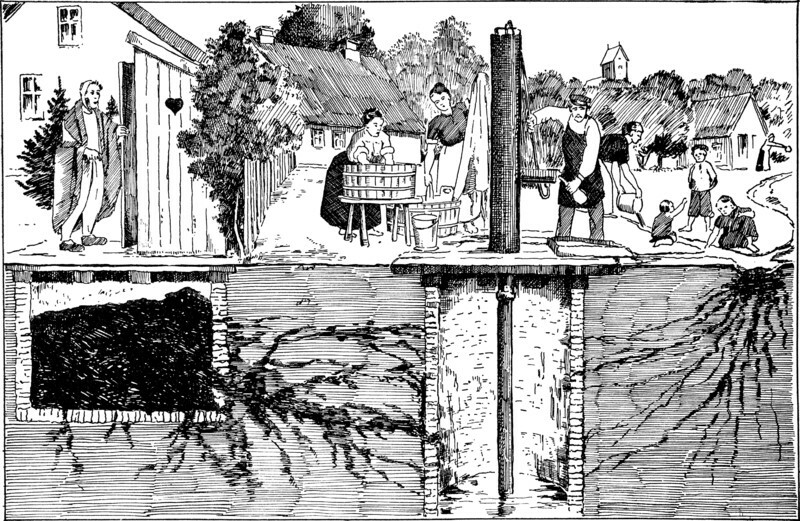 One version of Pettenkoffer’s theory backed by this unique feature of soil states that miasma is formed by the soil particles, and gets stored in these spaces (as gas or the like), and is then forced out of the ground when the water percolates into the soilbed and fills the empty air spaces. Another take on this theory is that soil itself has parts or particles that can effect the water as it passes through, mostly chemically, and as a result make that water pathogenic before it emerged from the soilbed. (Pettenkoffer had his own Z-factor theory as well, an equivalent to other unknown component based theories like Samuel Mitchell’s septon (for septic) theory linked to latrine-contaminated and perfect spoiled meats, tanneries, currying, and slaughterhouse settings). Without the knowledge of bacteria in the soil, both of these theories made sense. The most convincing places for this theory to be related to were the creek and river edges, places where alluvial grounds were mostly gravel and enabled diseases to spread quite easily between wells (Oregon Trail Platte River for example). Likewise, this helps to explain why Wiley blames the behavior of Cumberland area soil for the epidemic, a theory which Kober negates. It will be seen, therefore, that in this instance a peculiarly favorable soil for such an epidemic was present, and the townspeople have, with a disregard of the plainest rules of sanitation, simply brought the disease upon themselves . . .
Wiley’s map of typhoid is unique in that it focuses on a small community, water quality and santitation. Sanitation problems involving water have some very unique geographic behaviors. We normally don’t consider weather to be important to the geography of privies. Yet in certain urban settings, overflow remains a frequent experience for certain communities. 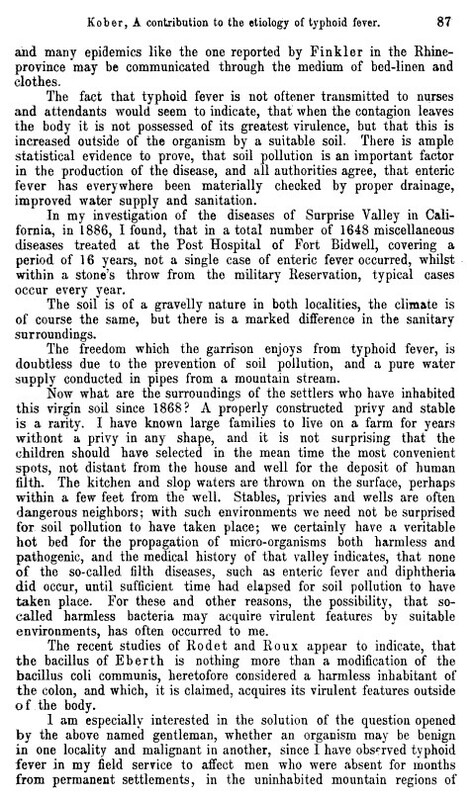 Nearly 125 years later, monitoring water quality is now so commonplace that it seems not at all unusual to us to read about Wiley’s and Kober’s discoveries today. But back when Wiley made his discovery, it was just a few years into the realization of how much of a role bacteria can play in the development of diseases. A decade earlier, no one would have understood or believed in what Wiley said about the cause for this epidemic. Ironically, Dr. Wiley died a few years after the publication of his report, due to gangrene. Dr. Kober continued to practice for another several decades, becoming the Dean for the medical school in Georgetown and devoting his life to the tuberculosis campaign. Another 10 to 15 years would have to pass before the first effective antibacterial drug was developed — penicillen. In 1880, typhoid fever was linked to the appropriate bacterium by Karl Joseph Eberth, identified today as Salmonella enterica enterica, serovar Typhi. By 1890, the physiological influences of Typhoid Fever were well known and understood and could be differentiated from Typhus. This association was confirmed four years later by Georg Theodor August Gaffky. In 1896, the first vaccination was developed. There is a possible sequence to the events related to this epidemic. Unlike typhus, a flea-vectored disease hosted usually by rodents that is caused by Rickettsia bacteria, typhoid does not depend upon rodentia or other animal hosts with flea infestations. It’s distribution and behavior differ in ecological and seasonal behaviors (rat-borne diseases coming off ship can occur more during months with cold nights). The Salmonella responsible for typhoid is primarily a disease of human waste and poor sanitation living settings. In VERHANDLUNGEN DES X. INTERNATIONALEN MEDICINISCHEN CONGRESSES, Berlin 4-9, 1890 (Berlin, 1891), mention is made of this epidemic and the details provided about its cause based on local observations (see appendix at the end of this page). In a more recent human ecological perspective, one could argue that since sanitation is a human feature, not a natural ecological trait, that man is the main cause for the growth and spread of this organism in a co-dependent fashion, relying upon people to persist. The first phase of this disease flow was ecologically, environmentally induced. The dam and backwash represent a human ecological cause, which then continues along the transportation routes headed back upstream. The yellow diffusion process represents a completely human behavior. It represents a reversed hierarchical diffusion pattern. The smaller/lower income settings are impacted first (poor and malnourished, unsanitary living/work settings), which in turn make the disease more likely to infect people, or for people to transmit to the sociologically exempt group. As a result, homes and neighborhoods in more fluent settings normally considered to be less likely to become involved, due to household rather than waterside latrine settings, become a part of the diffusion process. For more on Wiley, see Professional Brief Obituary for Wm. Wiley. 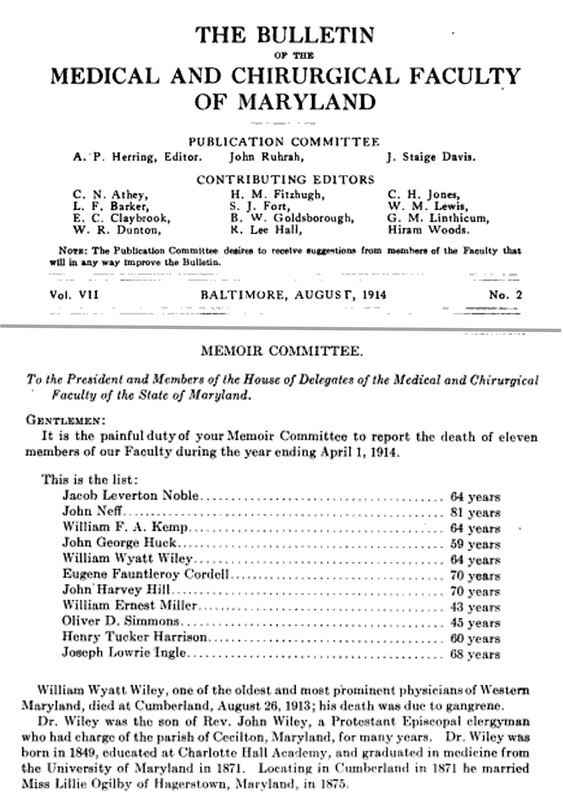 Transactions of the Medical & Chirurgical Faculty of the State of Maryland, vol. 106, 1904. 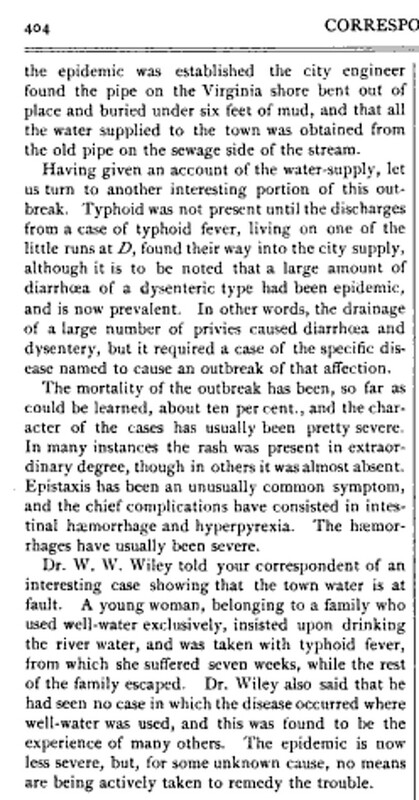 The original article, reporting this discovery of proof for typhoid in the field, follows. Anniversary Tribute to George Martin Kober: In Celebration of His Seventieth … edited by Francis Anthony Tondorf. The following Biography is pulled about Kober from a Georgetown University page. George Martin Kober was born on March 28, 1850 at Alsfeld, Hesse-Darmstadt,Germany to Johann Jacob Kober and Johanna Dorothea Bar. He received his early education at the Grosshevzogliche Realschule in Alsfeld, but emigrated in 1866 to the U.S. at the insistence of his father who did not favor the thought of his son serving under the German principality. Kober joined his brother at Carlisle Barracks in Pennsylvania, where the latter had joined as a soldier. In August 1867, Kober began work under the surgeon Joseph J.B. Wright at the barracks hospital. With the assistance of Dr. Wright, Kober was soon promoted as hospital steward, by which time he had decided on a career in medicine. He was next ordered to the Frankford Arsenal near Philadelphia, where he studied with Dr. Robert Bruce Burns. In1871, Kober was assigned to the office of the surgeon general of the U.S.Army in Washington, D.C., and began evening courses at the Georgetown University School of Medicine, studying under Jonson Eliot, M.D. and Robert Rayburn, M.D. He received his M.D. degree from Georgetown in 1873. In the same year, Dr. Kober was the first to complete the postgraduate course instituted by Harry J. Thompson, M.D. and Samuel C. Busey, M.D., at the Columbia Hospital for Women, Washington, D.C. In July, 1874, Dr. Kober was appointed acting assistant surgeon, U.S. Army,then post surgeon at Alcatraz Island in California. His next appointment was post surgeon at Fort McDermott until July 1877. He participated infield expeditions in northeastern Nevada against the Indians, 1875; in Idaho concerning the Nez Perce Indian tribe; and was in charge of the field hospital at Kamiah on the Clearwater, Idaho, from July to October 1877. Dr.Kober was then post surgeon at Fort Coeur d’Alene from November 1877 to November 1870; at Fort Klamath, Oregon until June 1880; and at Fort Bidwell, California from 1882 to 1888. In late 1888, Dr. Kober returned to Georgetown University when he was appointed as professor of state medicine, and then as professor of hygiene in 1890.. In August of the latter year, he was elected a member of the tenth International Medical Congress. He returned briefly to For Bidwell in December 1890, but established permanent residence in Washington by 1894. 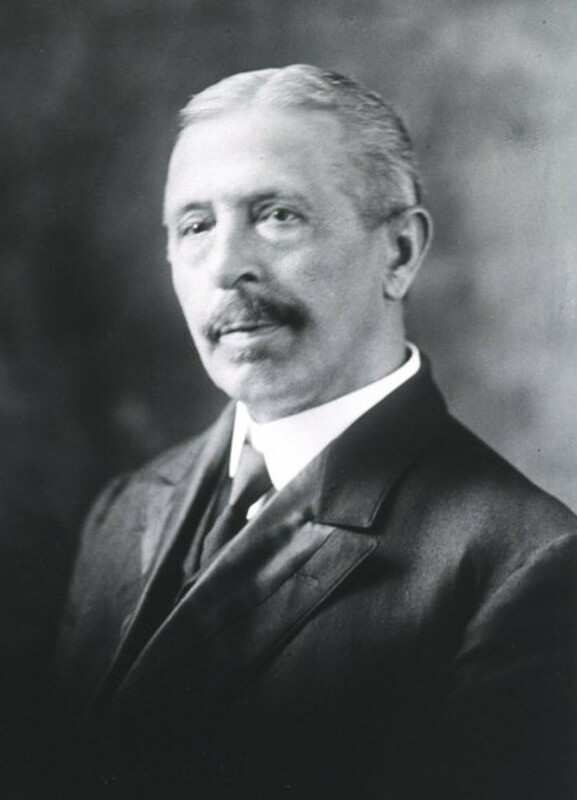 Dr. Kober became dean of the Georgetown School of Medicine in 1901, in which capacity he served until 1928, marking the longest tenure in the history of the deanship at the time. From 1916 until his death, he was a member of the consultant staff at virtually every hospital in the Washington area: the Children’s Hospital, Georgetown University Hospital,and of Gallinger Municipal Hospital (later, D.C. General Hospital). He was a member of many associations in the profession, such as the American Medical Association, American Association for the Advancement of science, Association of American Physicians, Association of Military surgeons, Washington Academy of Sciences, and the American College of physicians; and a president of such organizations as the National association for the Study and Prevention of Tuberculosis, National housing Association, Medical and Surgical Society of the District of Columbia, Washington Anthropological Society, Association of American Medical Colleges . 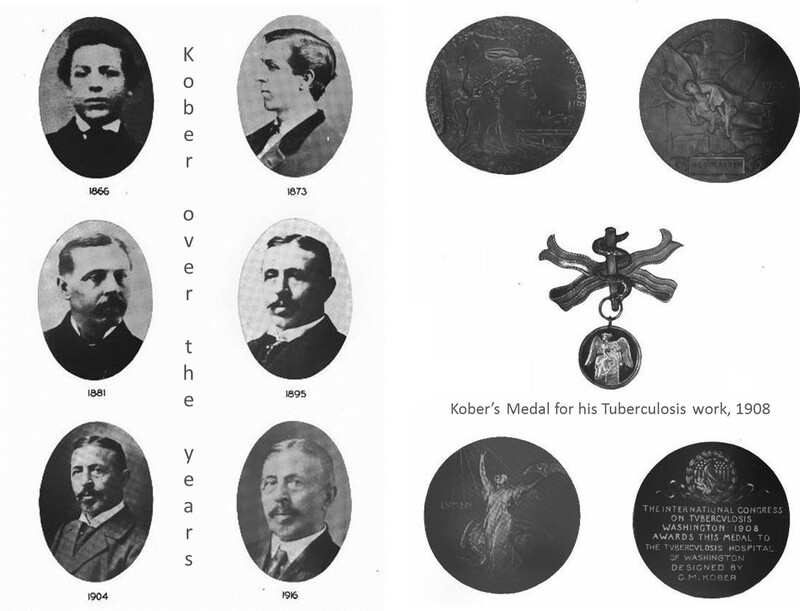 Dr. Kober was a pioneer in the study of tuberculosis and designed the Tuberculosis Hospital in Washington, D.C. He brought unprecedented attention to the pollution of the Potomac River as a cause of typhoid in the Washington area. 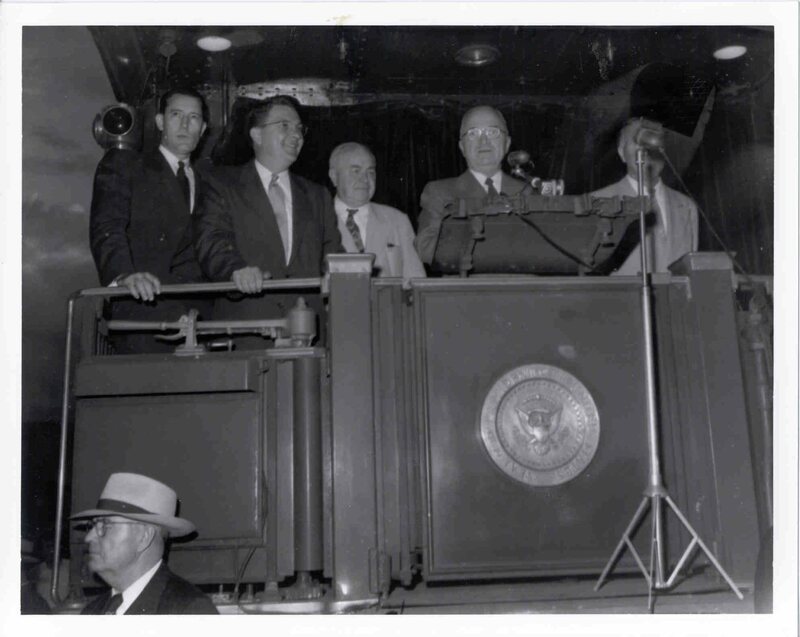 He is credited with the first published report on the use of iodine as an antiseptic and was a principal promoter of the Washington Sanitary Improvement Company, which offered a 5 percent investment and provided moderate income families with sanitary homes at a reasonable cost. Georgetown University honored Dr. Kober with the presentation of an honorary degree in 1906 for an LL.D. and in 1923 for an Litt.D . In 1923, to commemorate the fiftieth anniversary of his graduation from Georgetown University, Dr. Kober established a fund that would support, among other projects, a scholarship to the School of Medicine and an annual lecture known as the Kober lecture given by outstanding professionals in medicine.The first lecture was given in 1925. Dr. Kober died of heart disease in his Washington home on April 24, 1931. Some of the photos in my review were pulled from the following part of the Korns Family Genealogy Webpage: http://korns.org/misc/RR-TC/RR-TC.html. This ca. 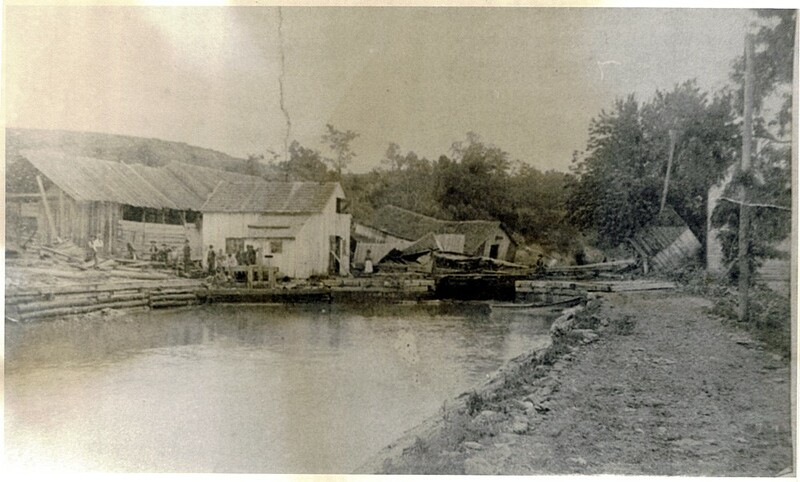 1905-1915 photograph depicts the river on the other side of the tall-stack factory building. Reflections appear in the water.